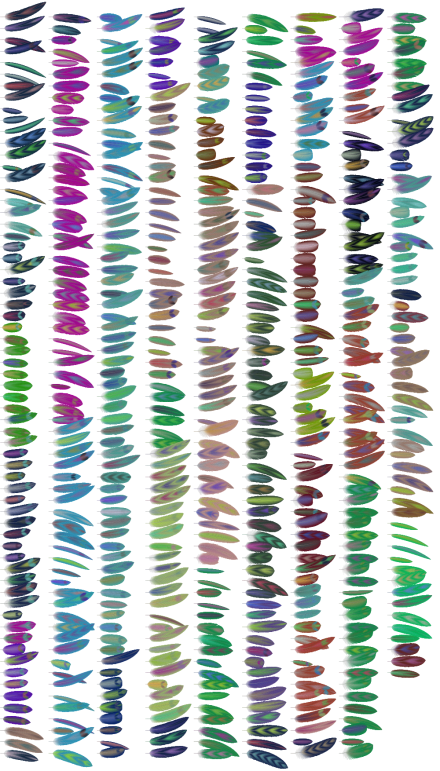 Beck, Fabian. 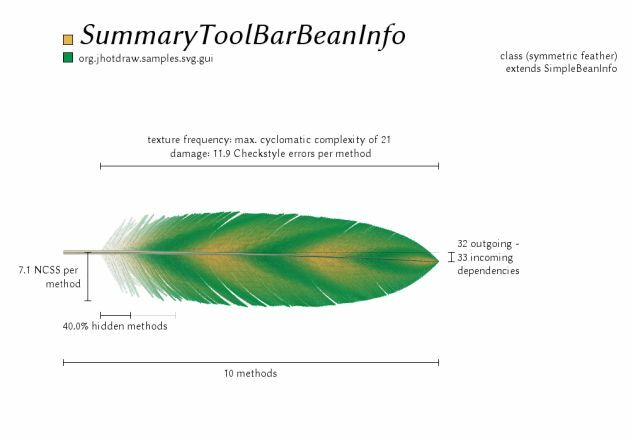 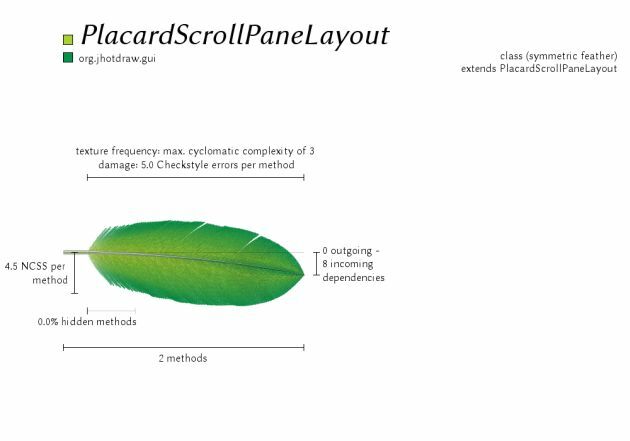 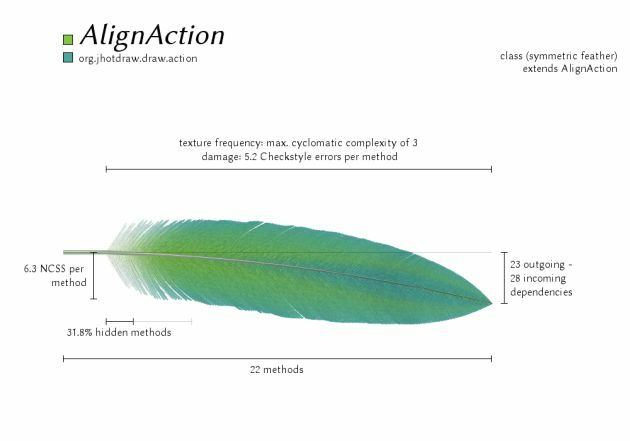 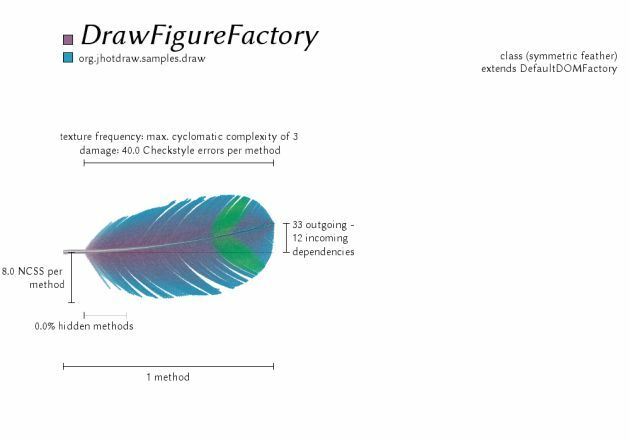 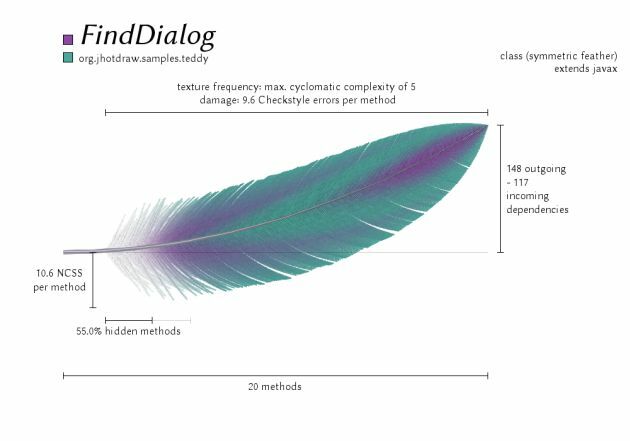 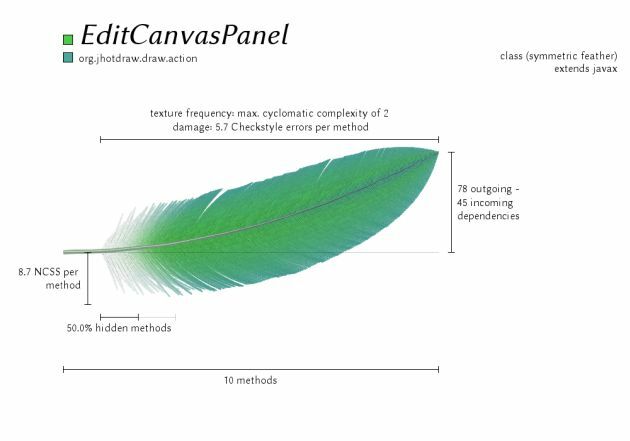 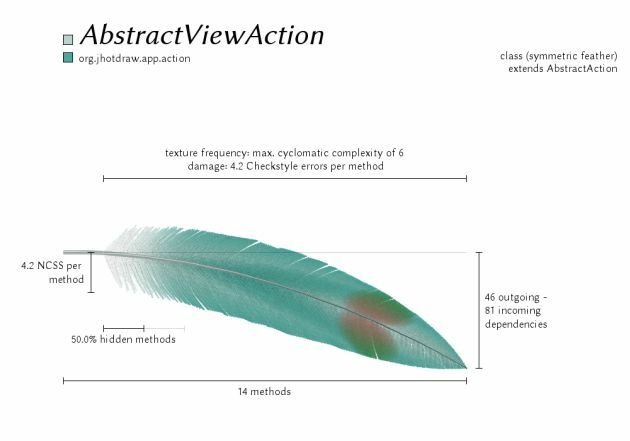 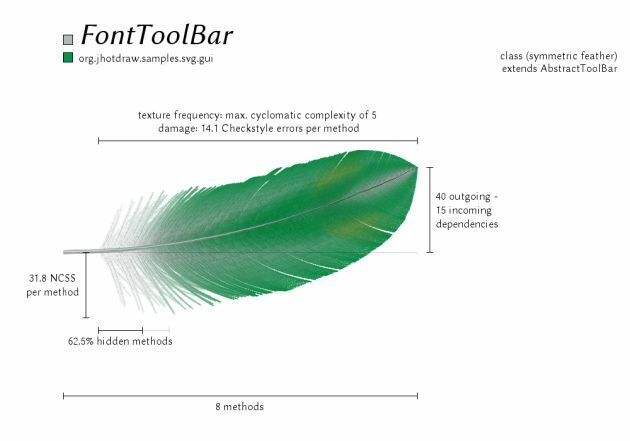 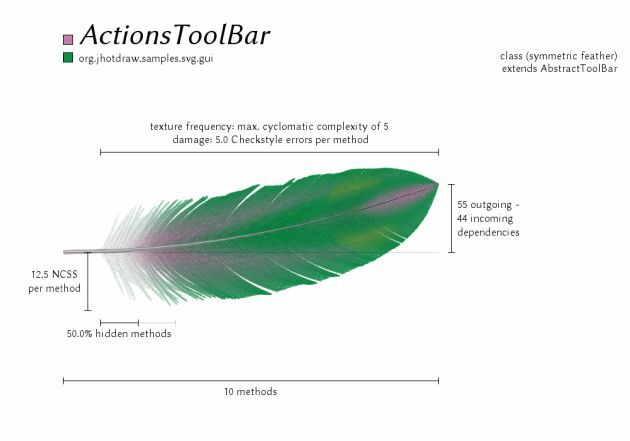 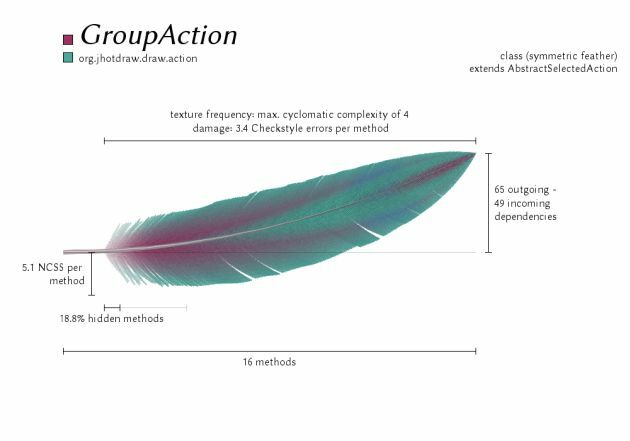 Software Feathers: Figurative Visualization of Software Metrics. 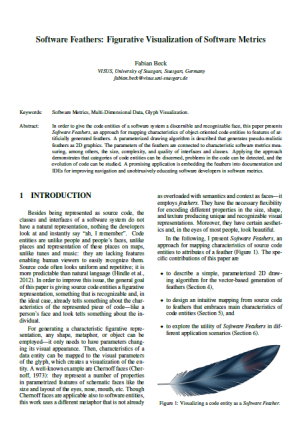 In IVAPP '14 Proceedings of the 5th International Conference on Information Visualization Theory and Applications. 2014 (to appear). 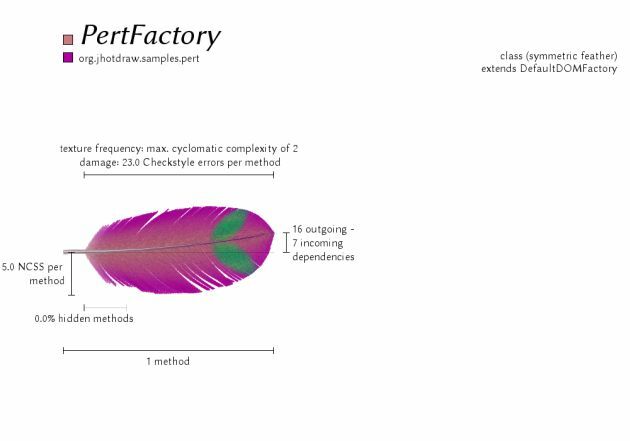 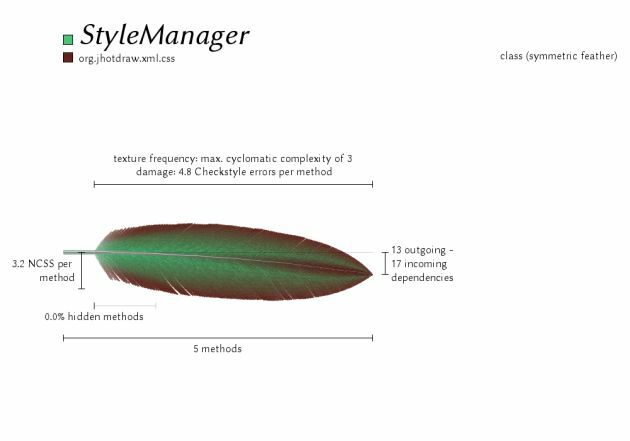 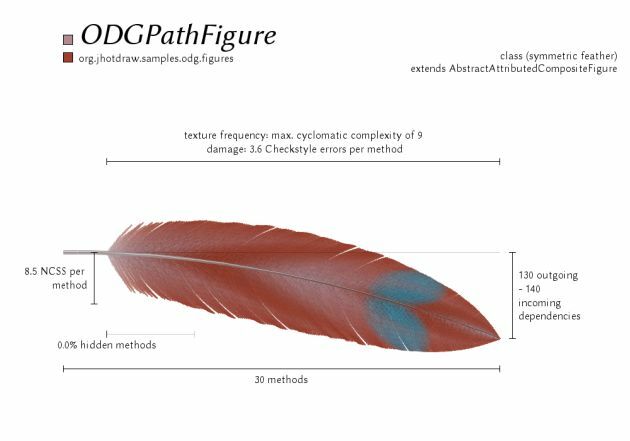 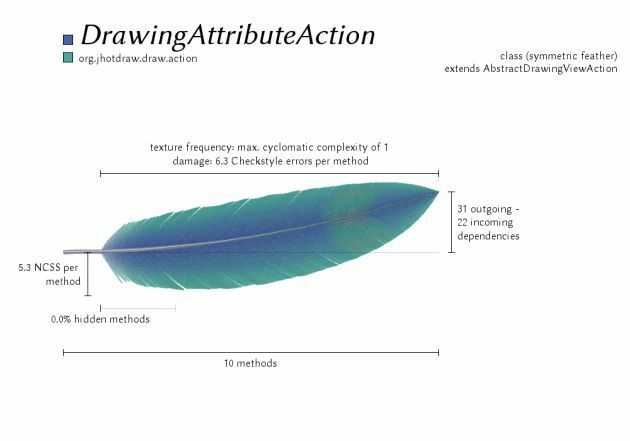 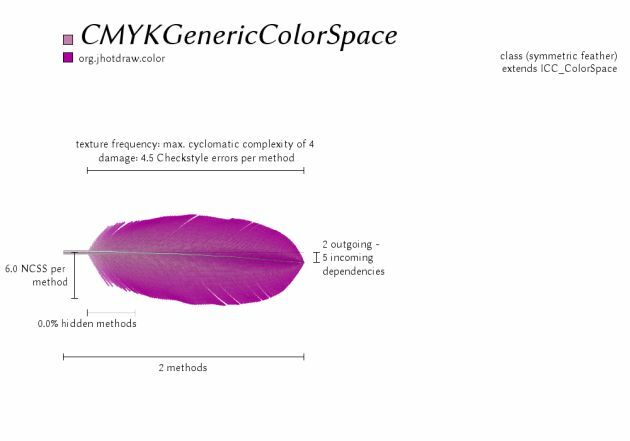 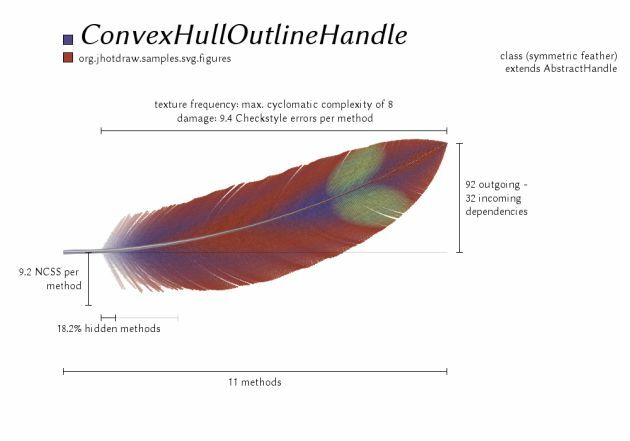 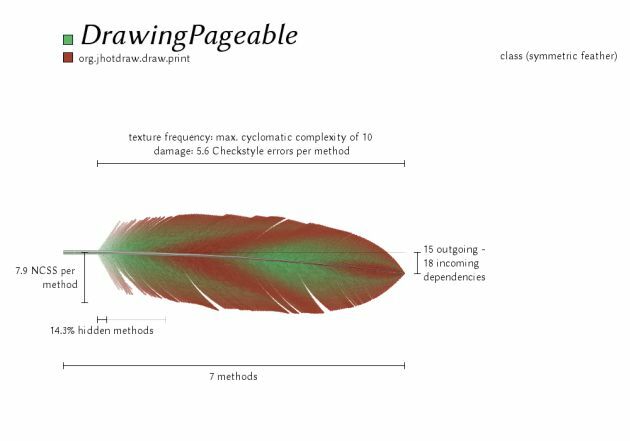 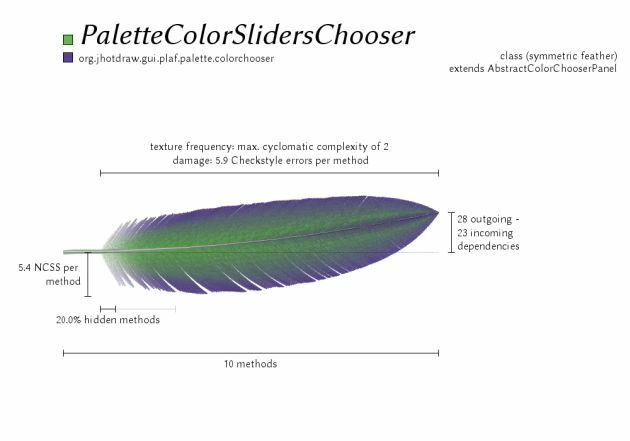 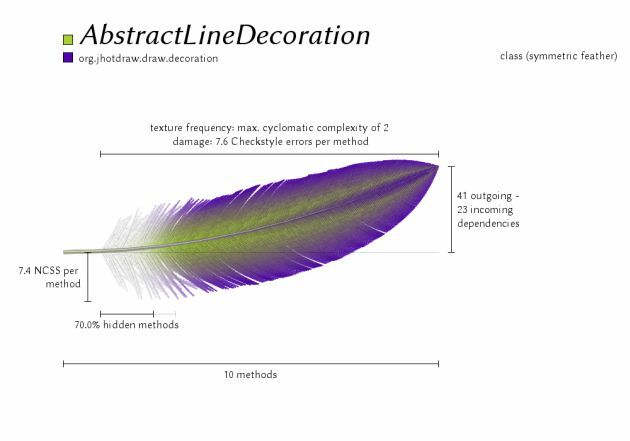 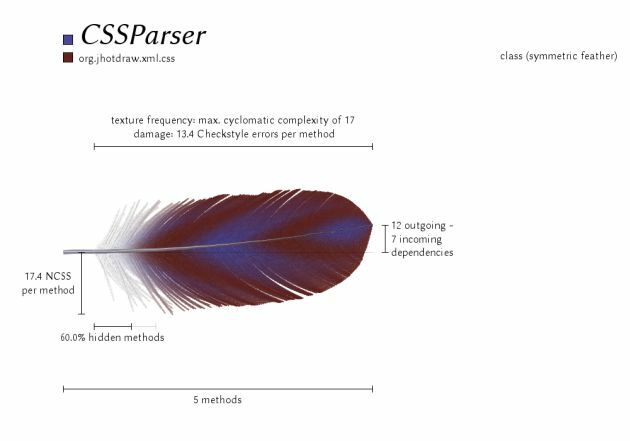 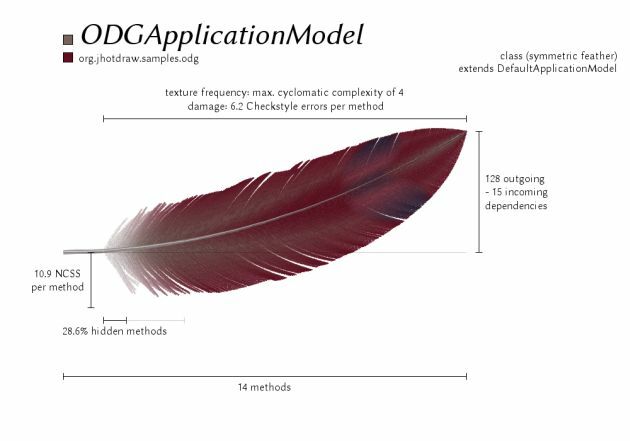 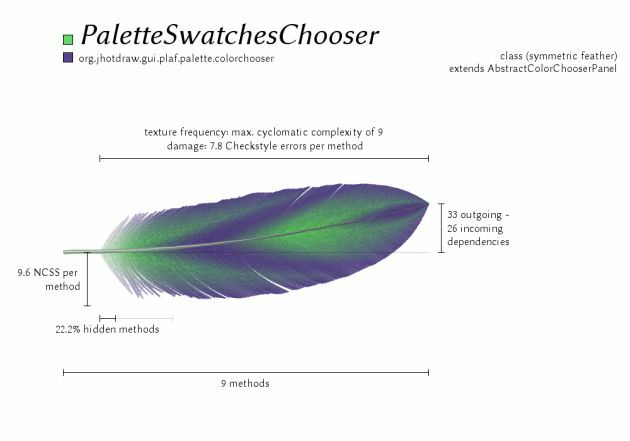 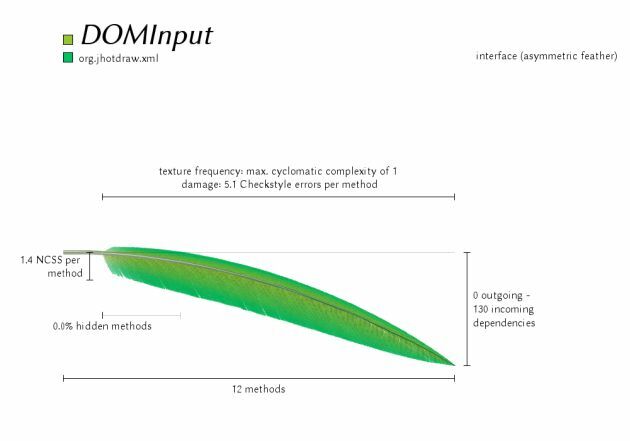 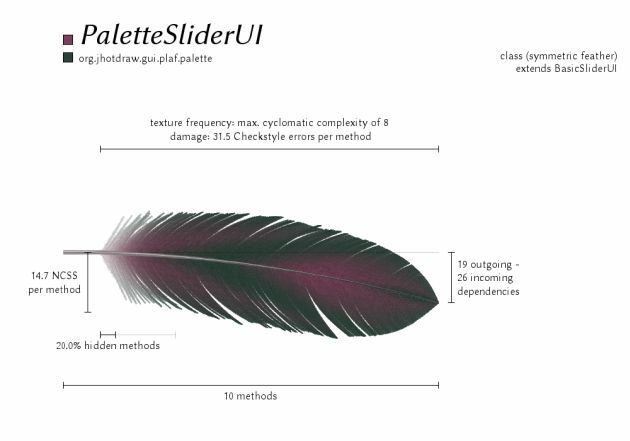 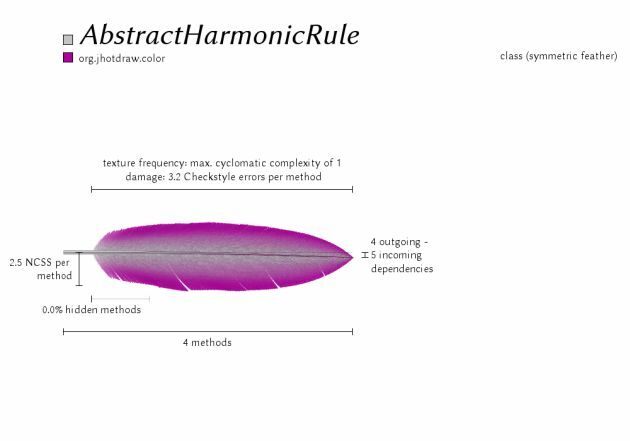 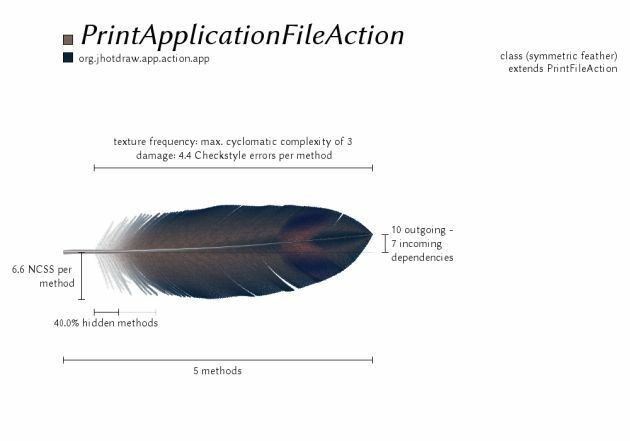 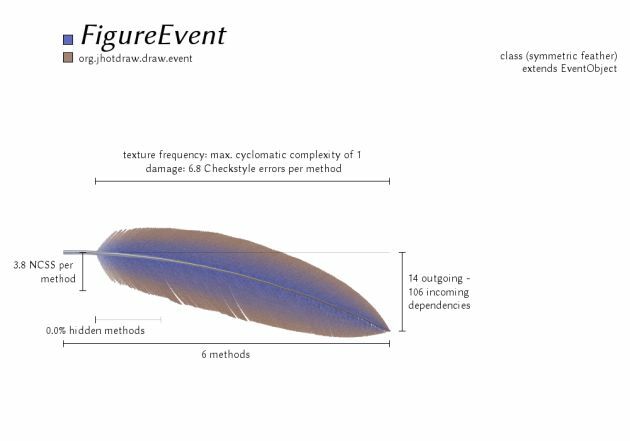 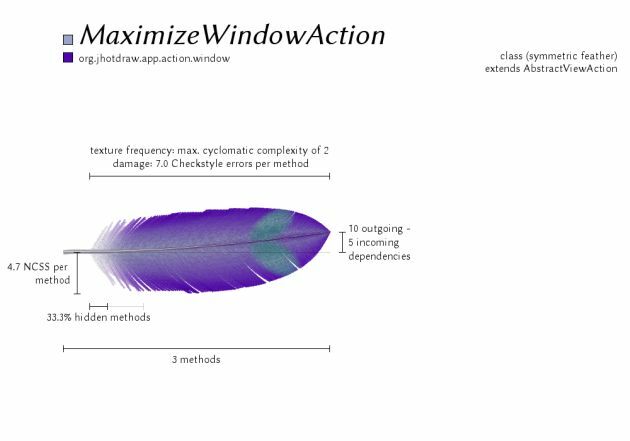 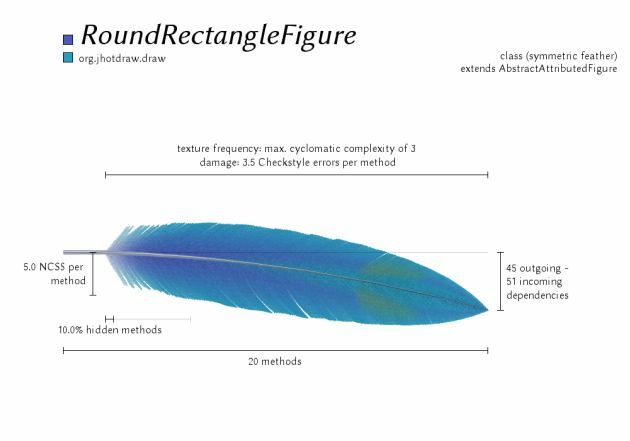 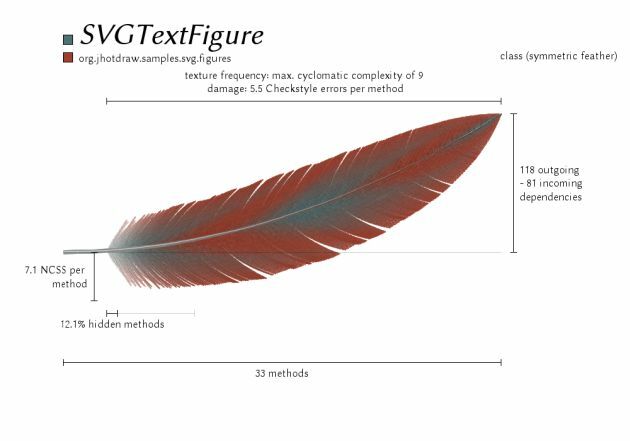 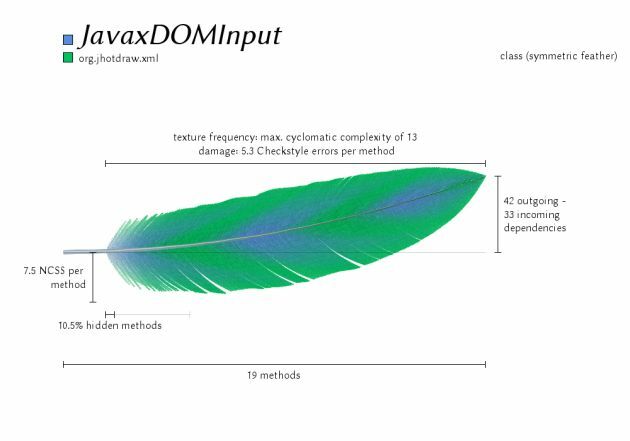 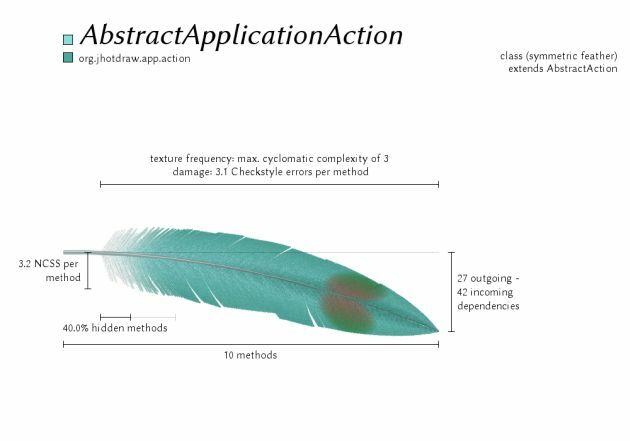 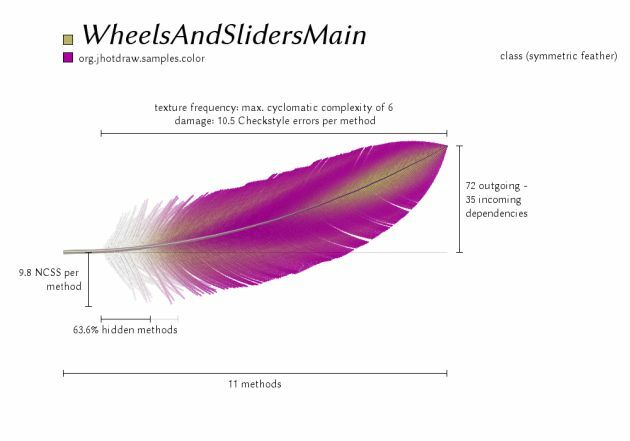 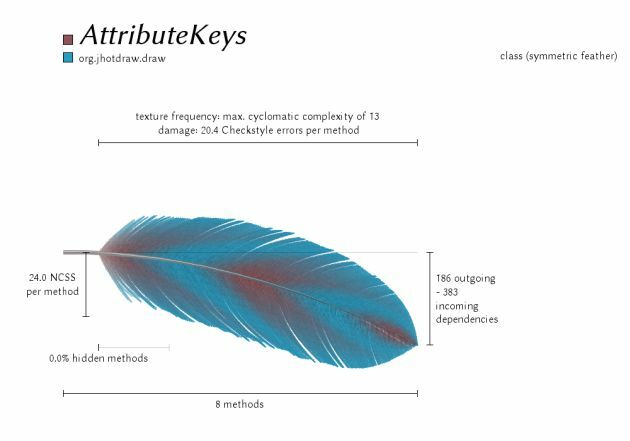 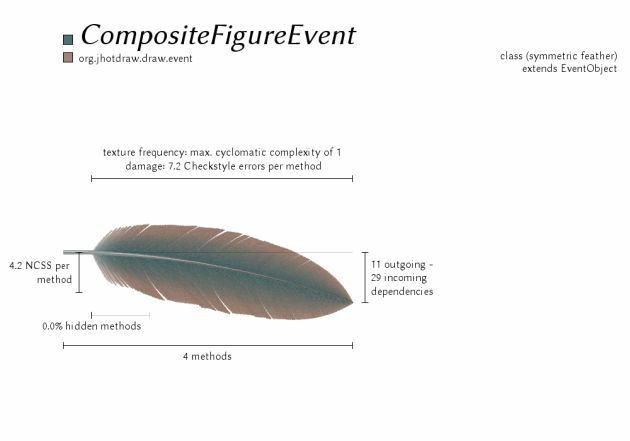 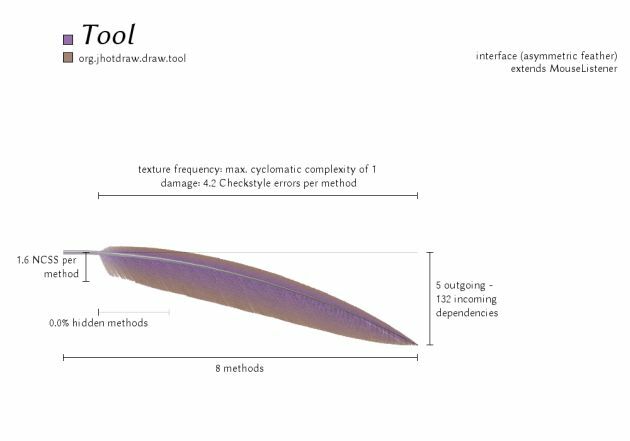 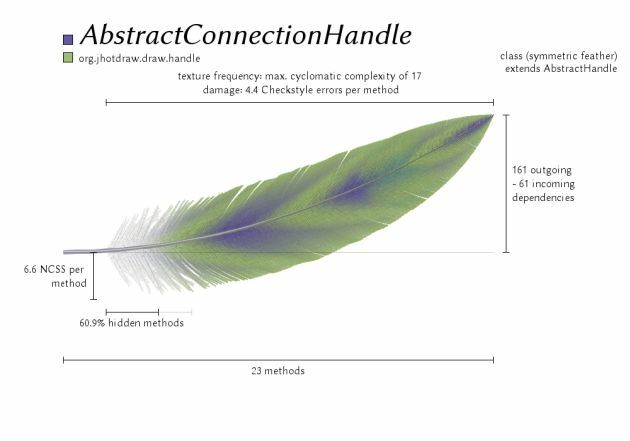 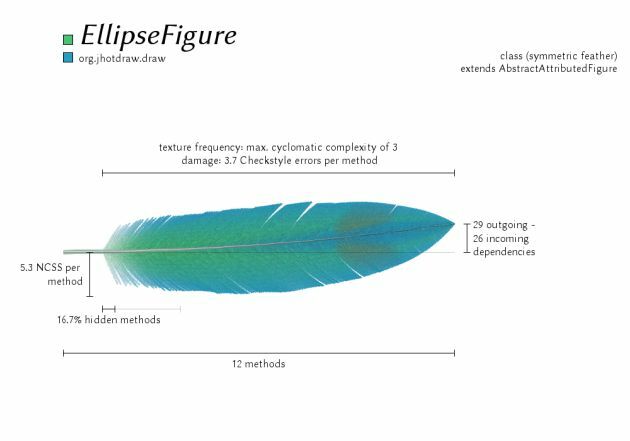 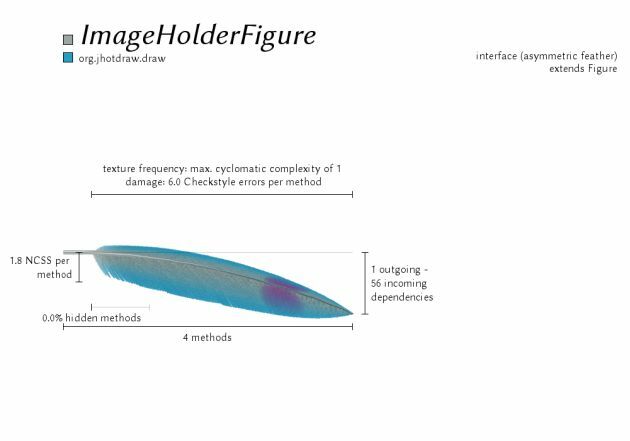 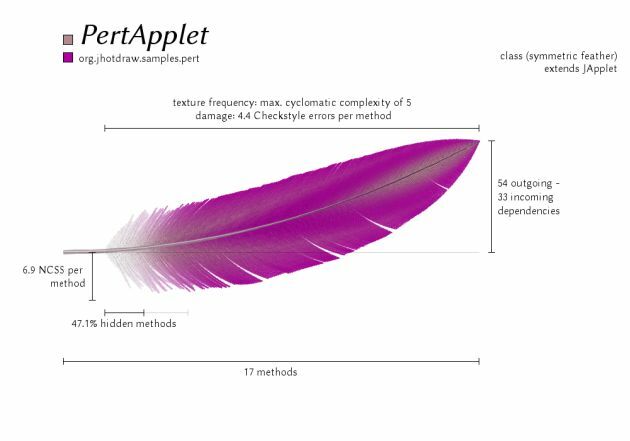 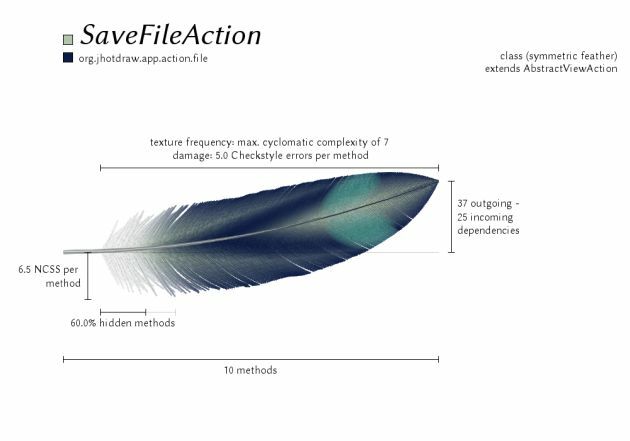 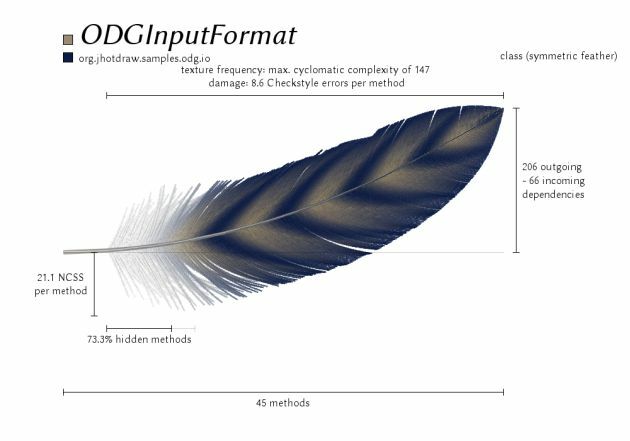 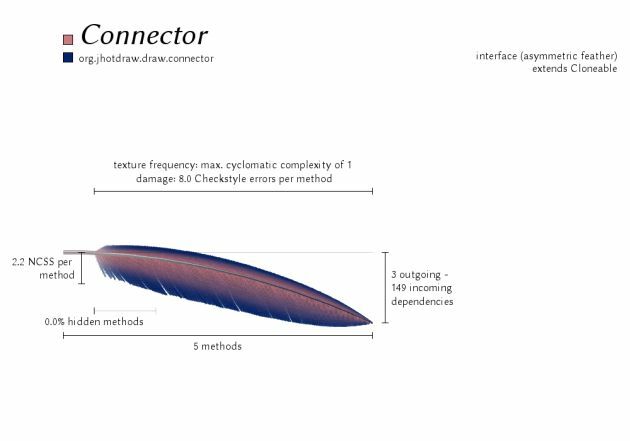 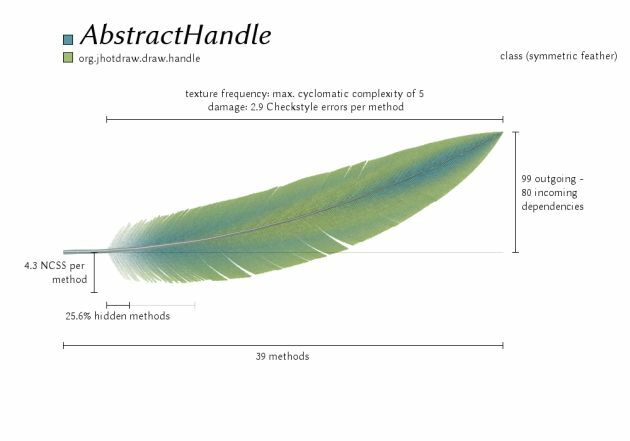 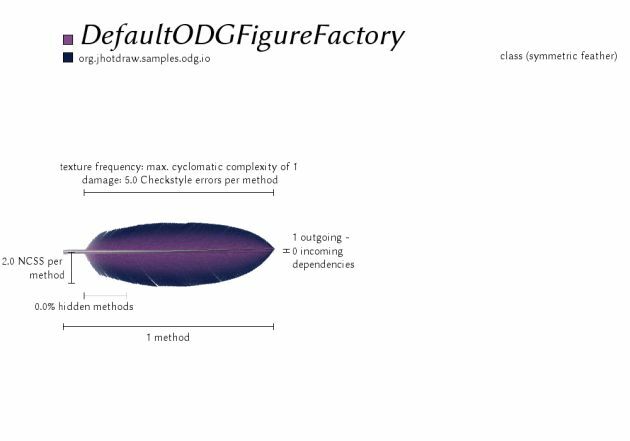 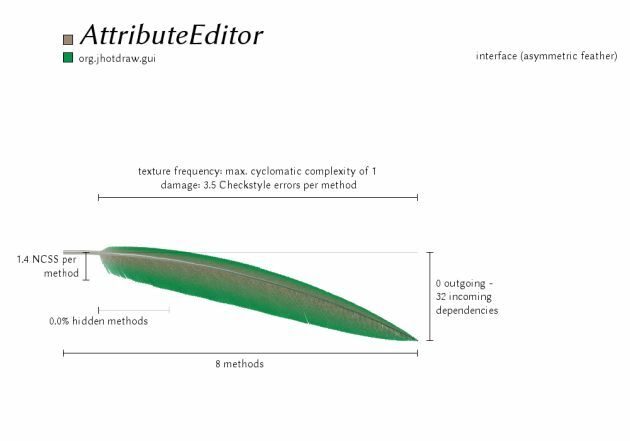 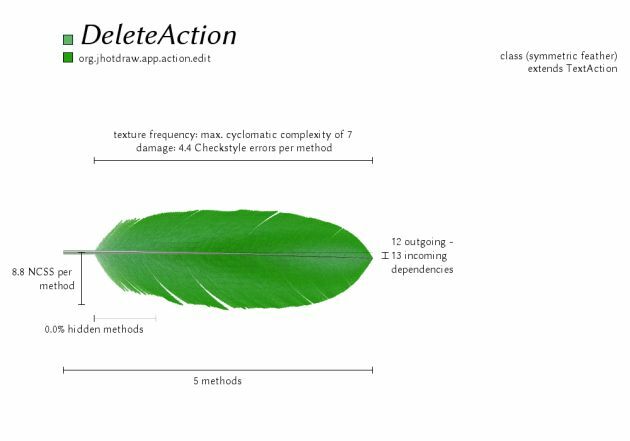 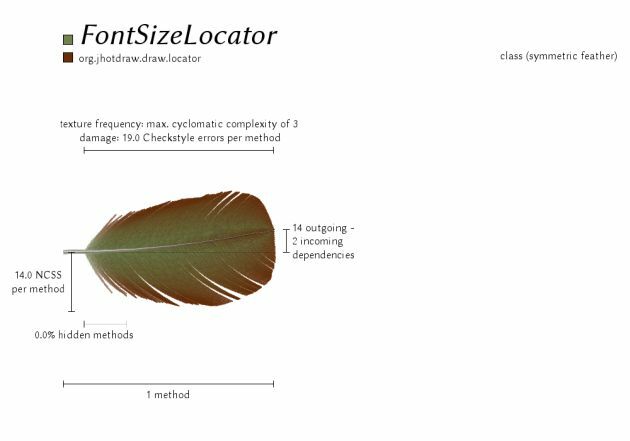 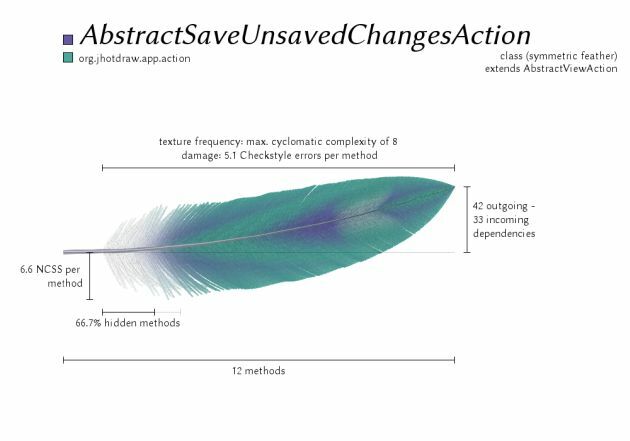 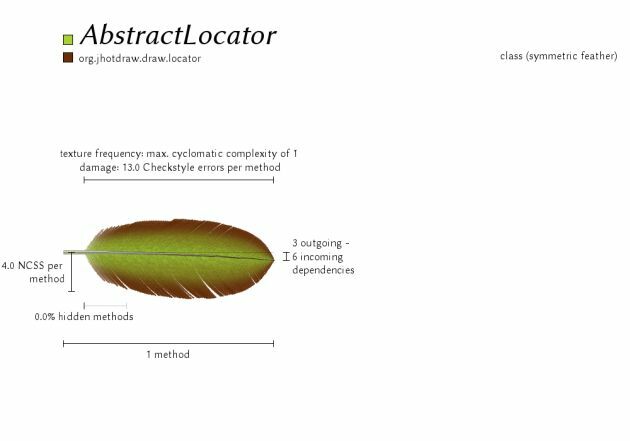 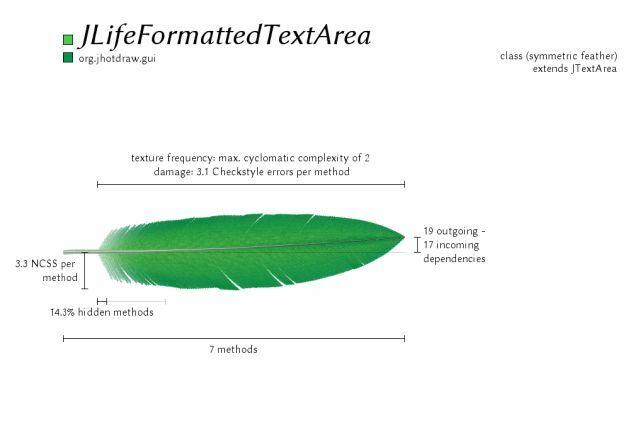 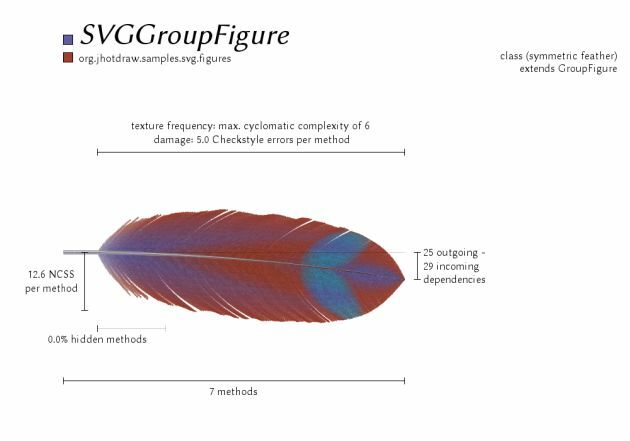 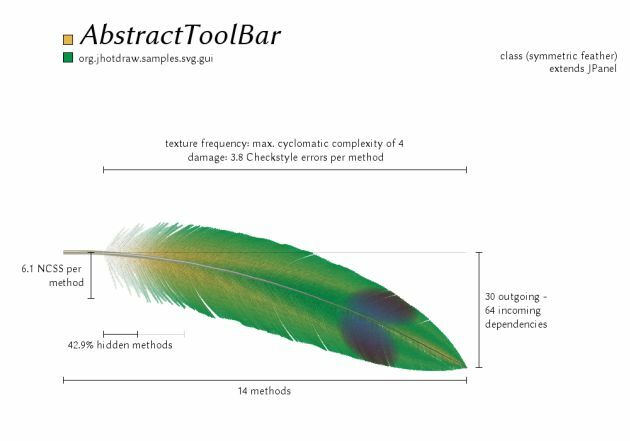 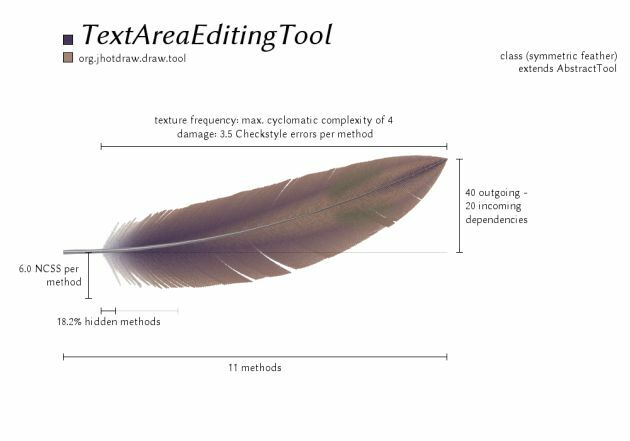 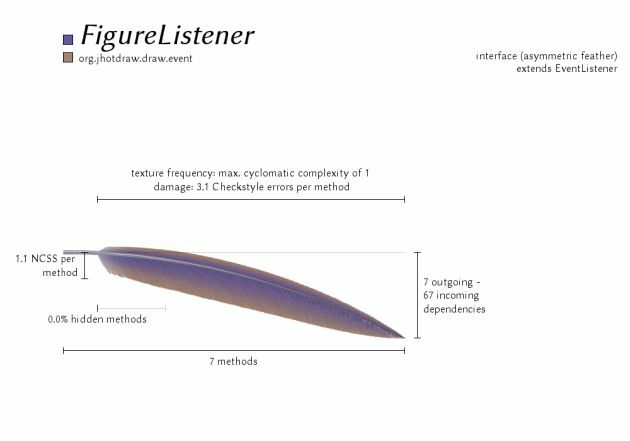 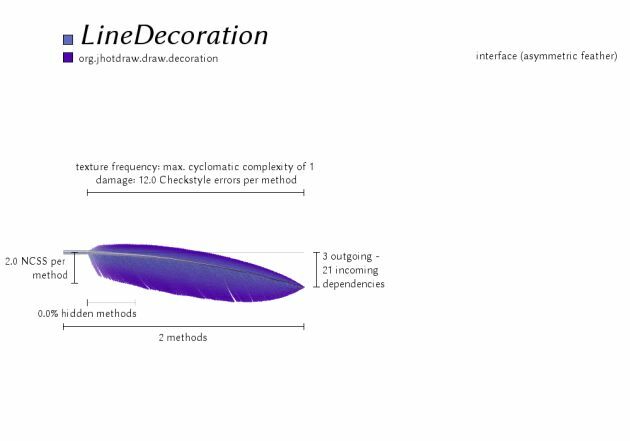 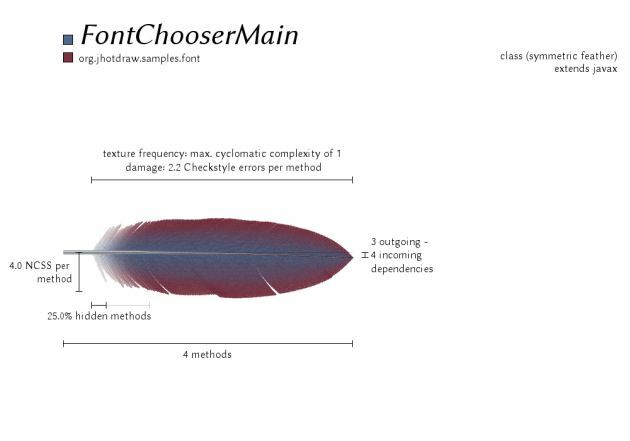 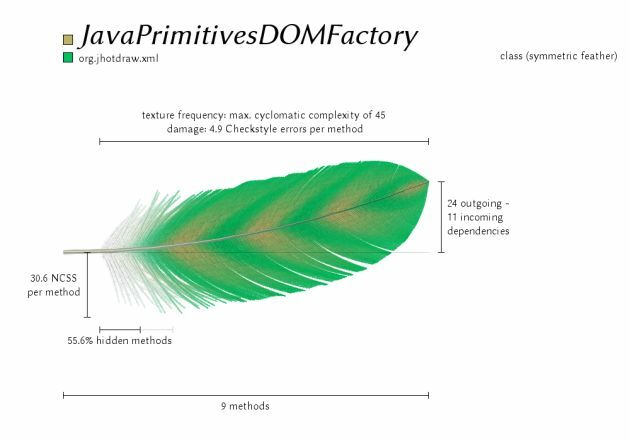 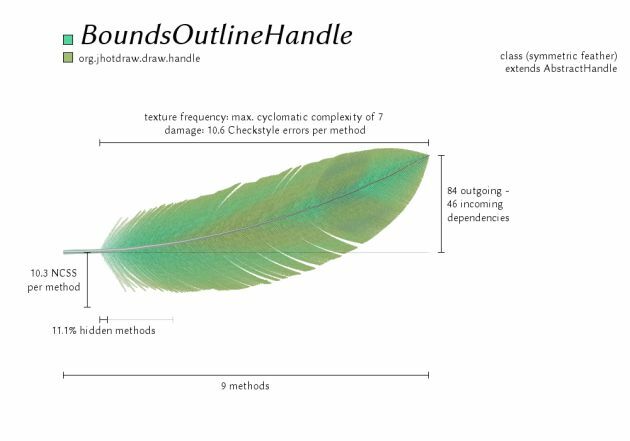 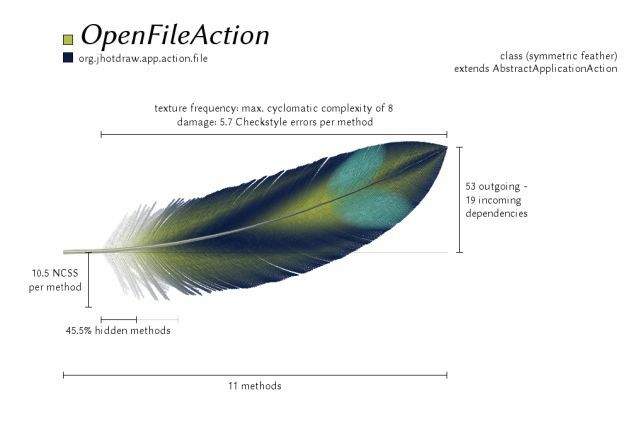 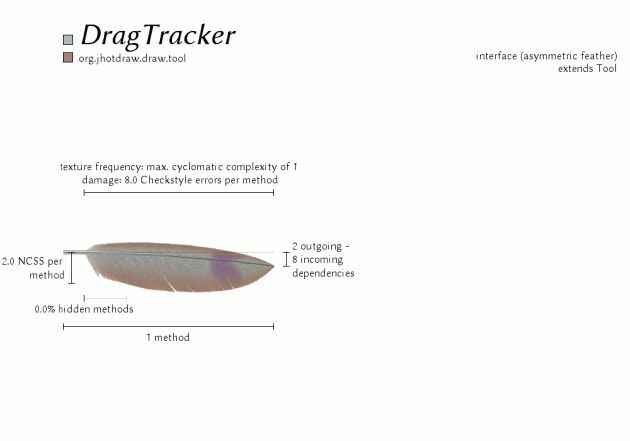 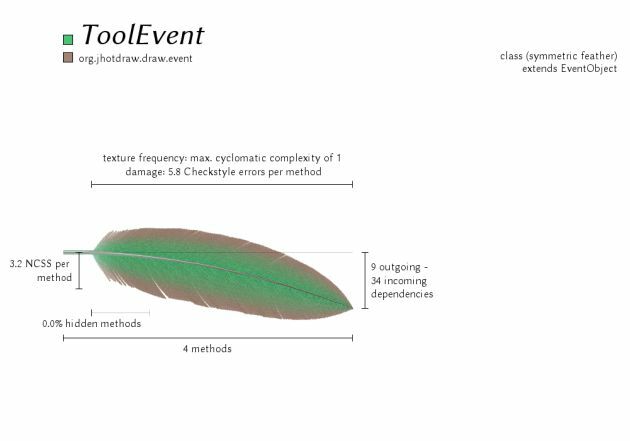 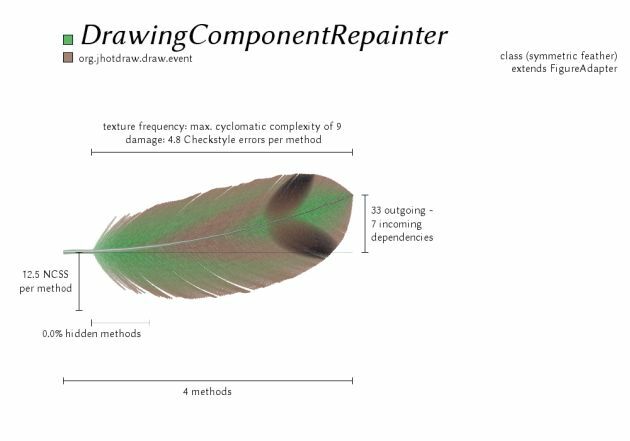 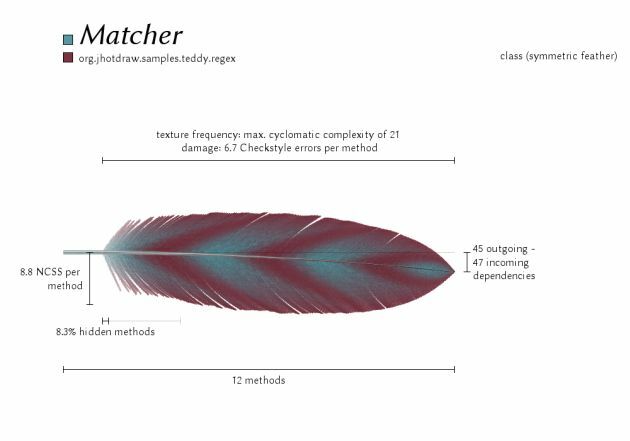 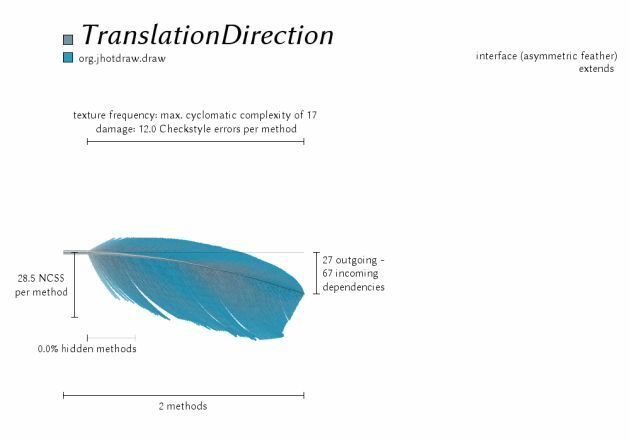 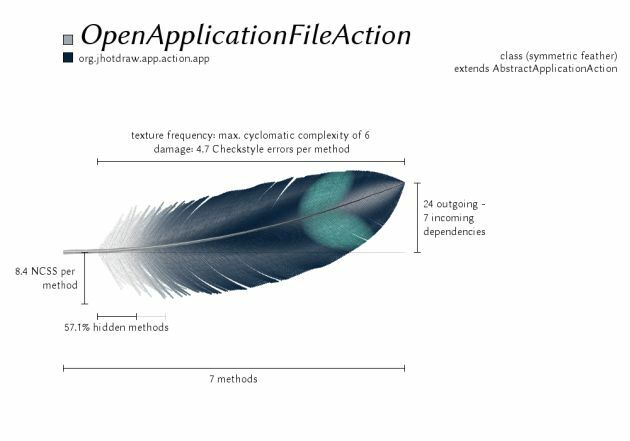 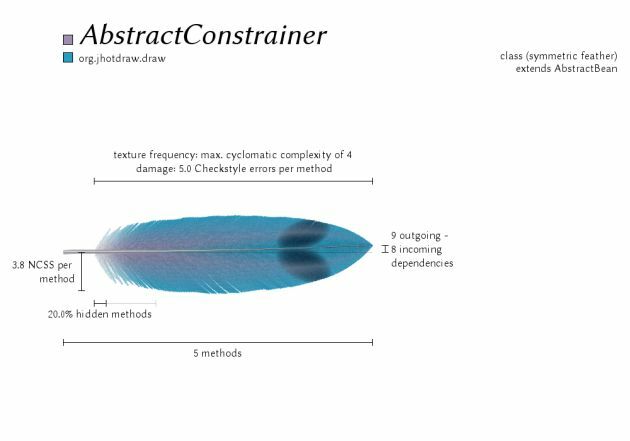 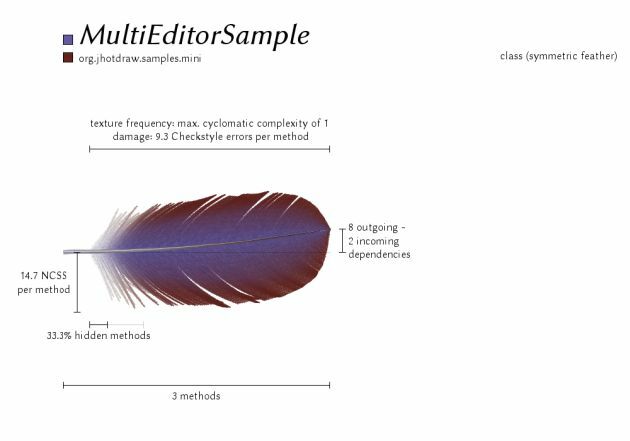 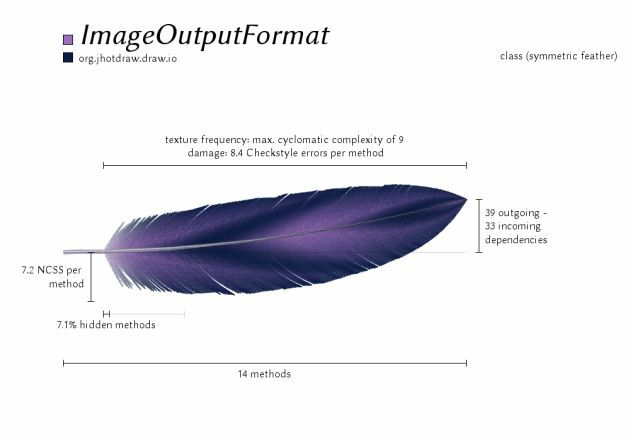 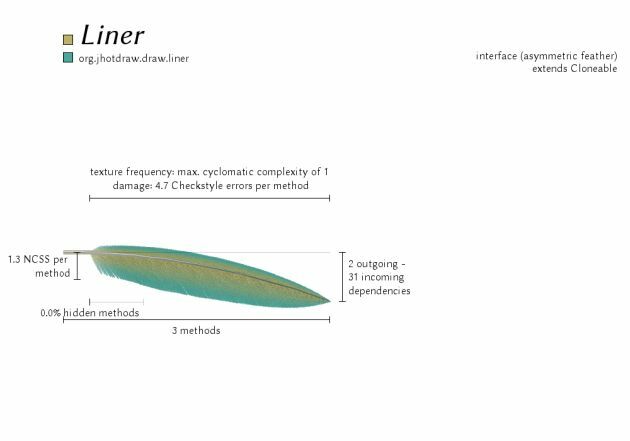 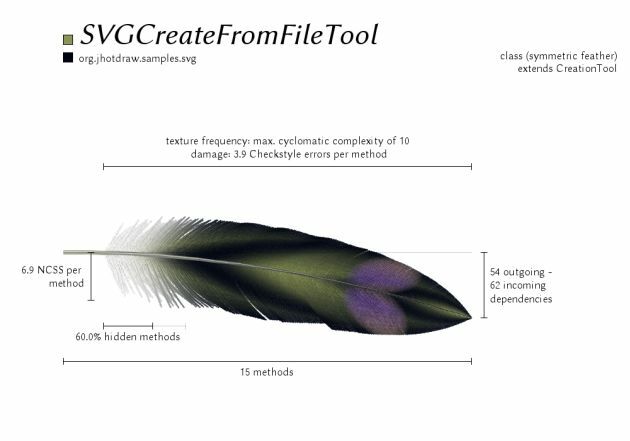 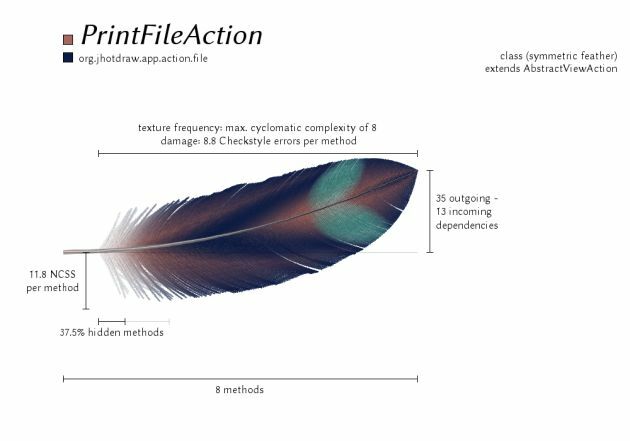 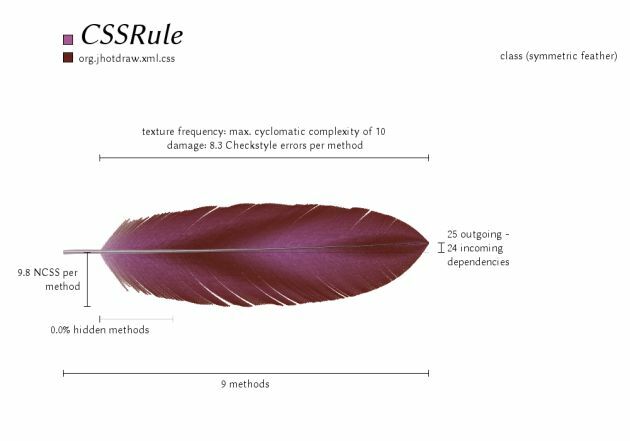 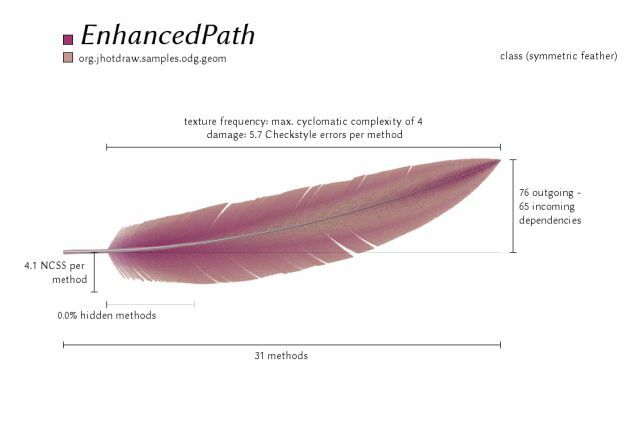 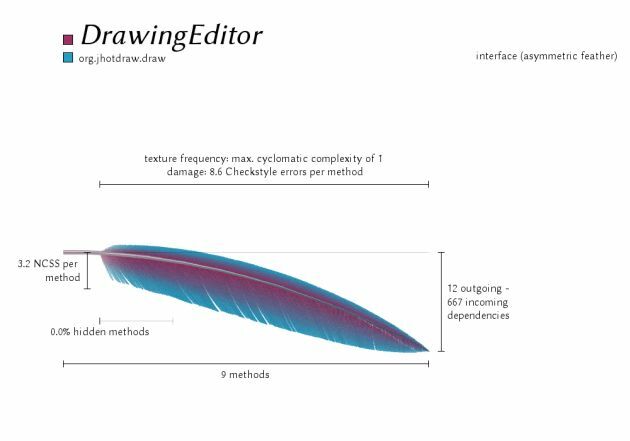 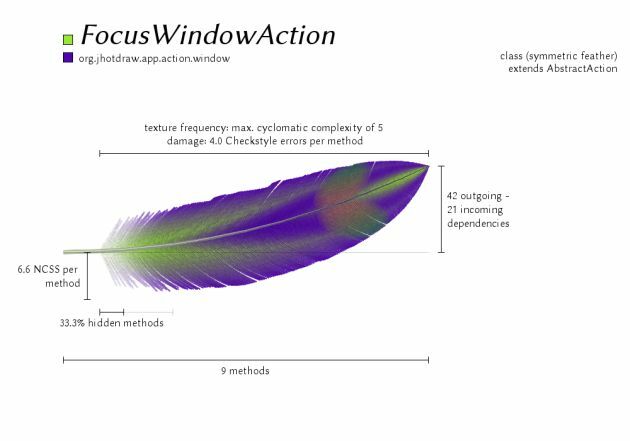 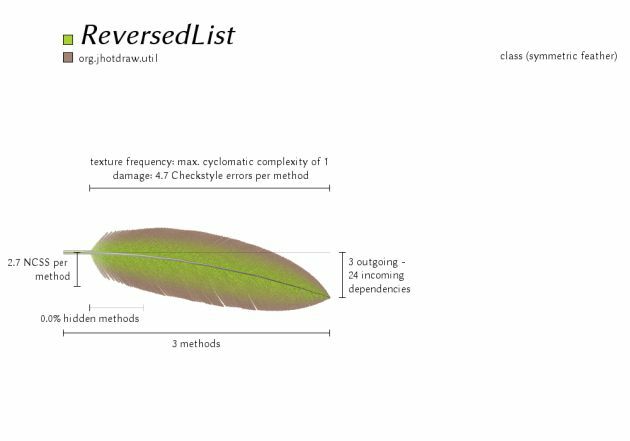 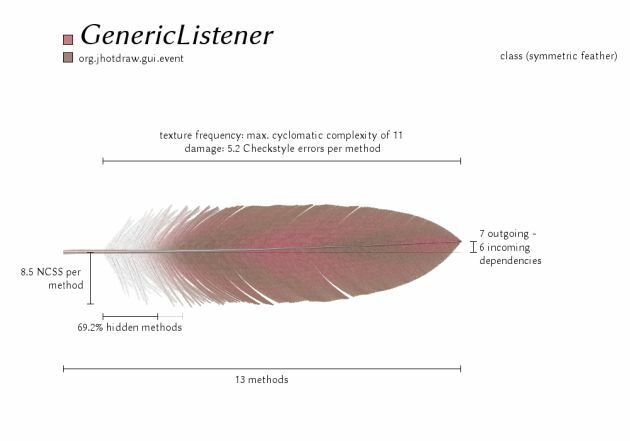 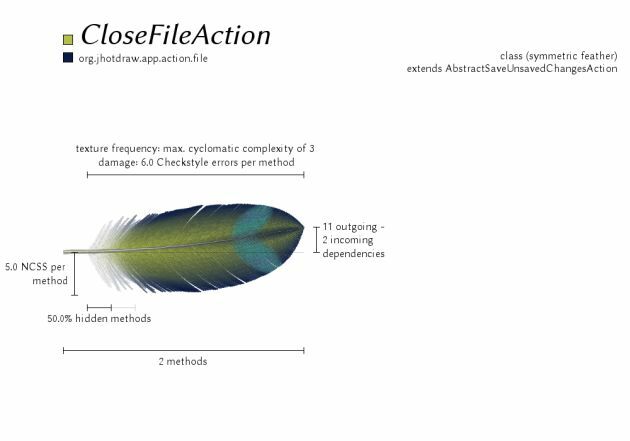 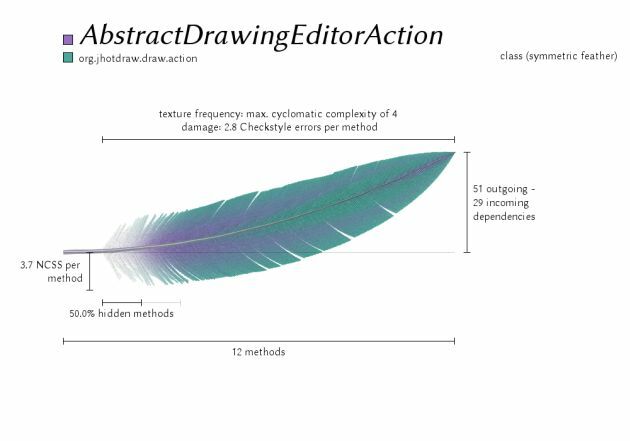 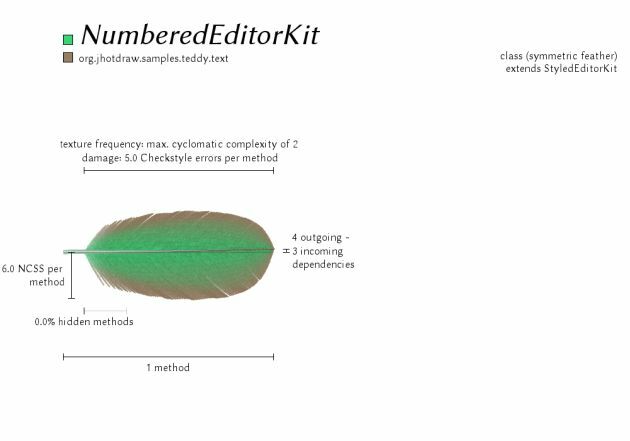 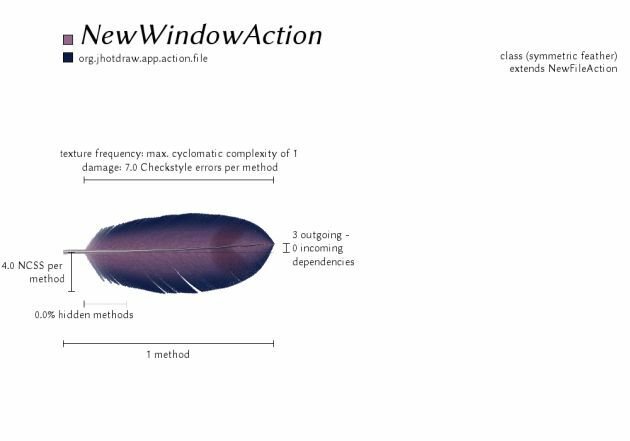 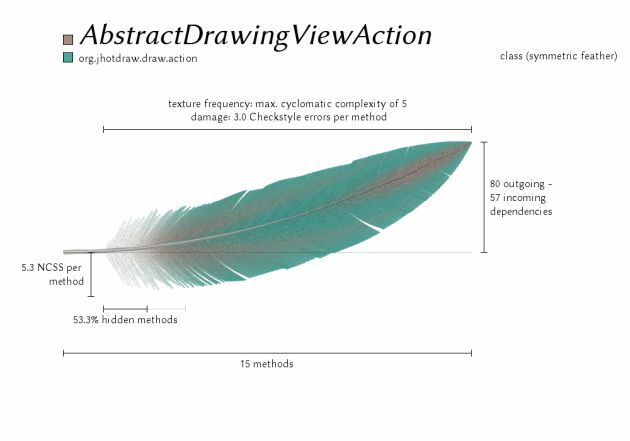 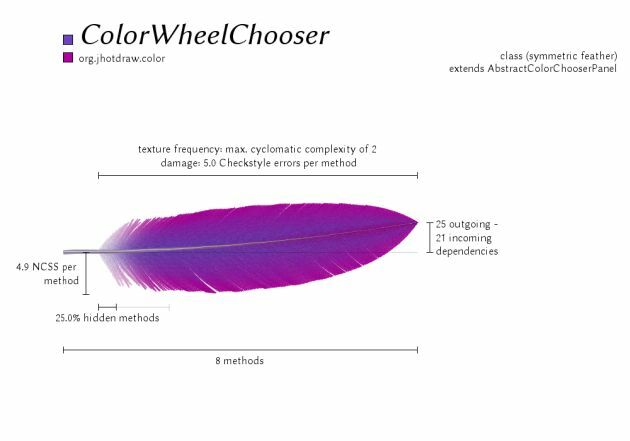 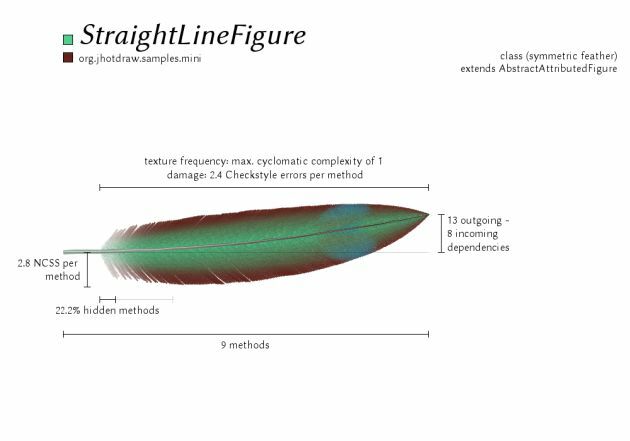 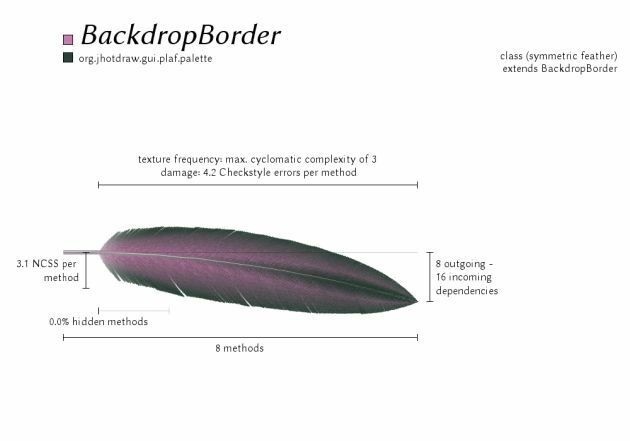 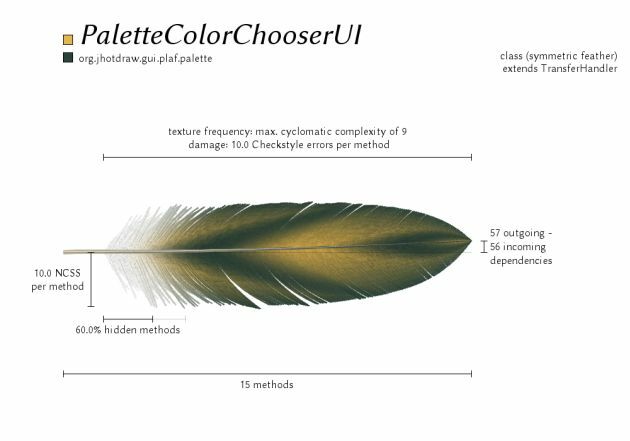 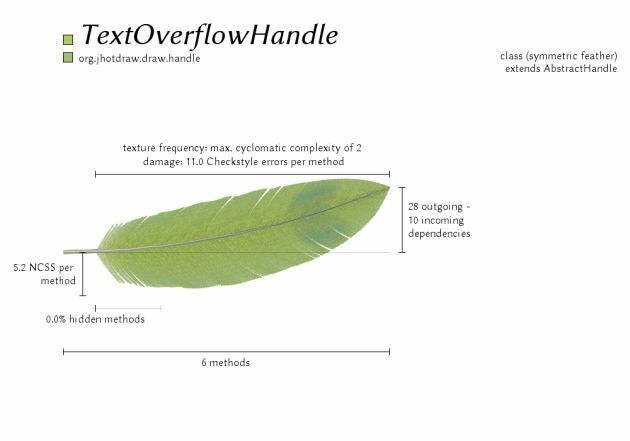 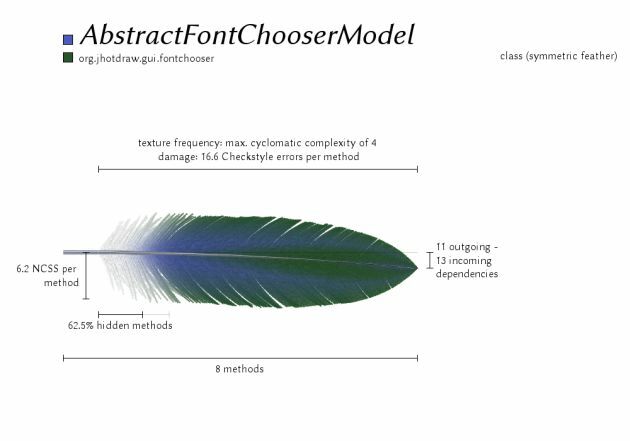 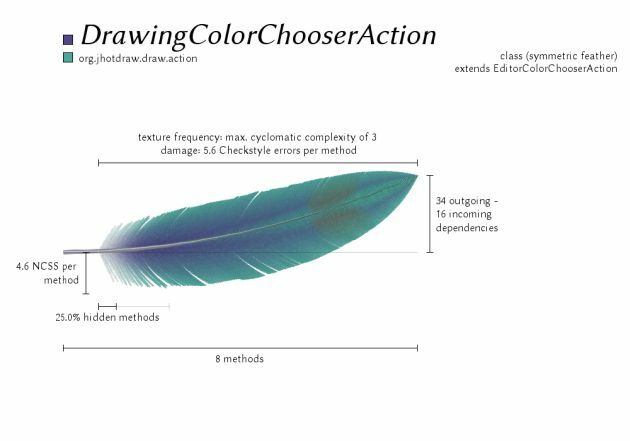 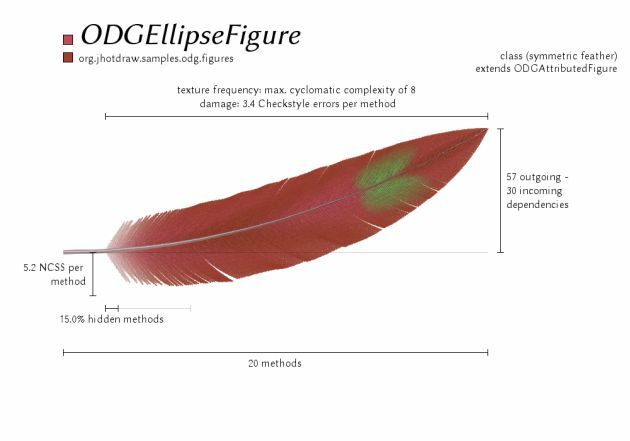 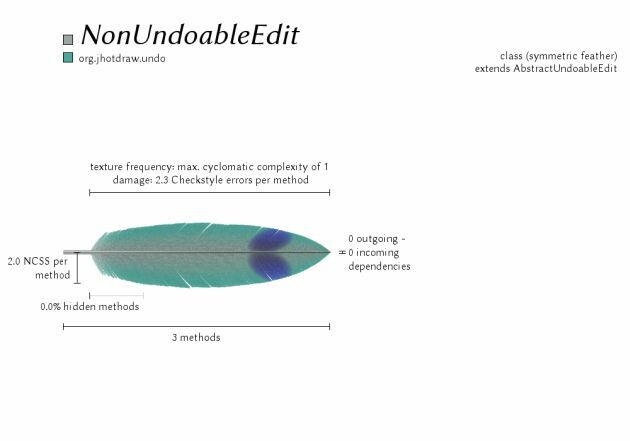 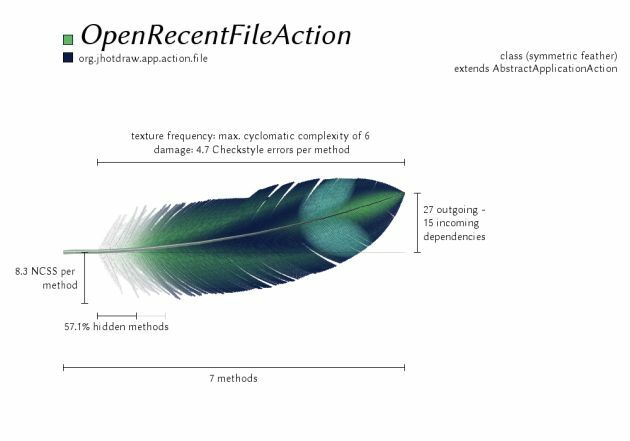 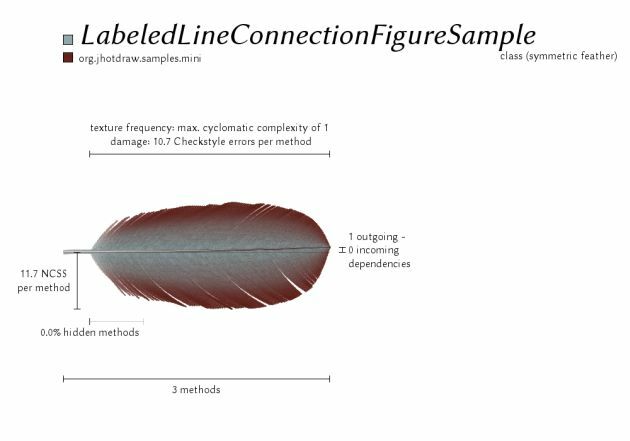 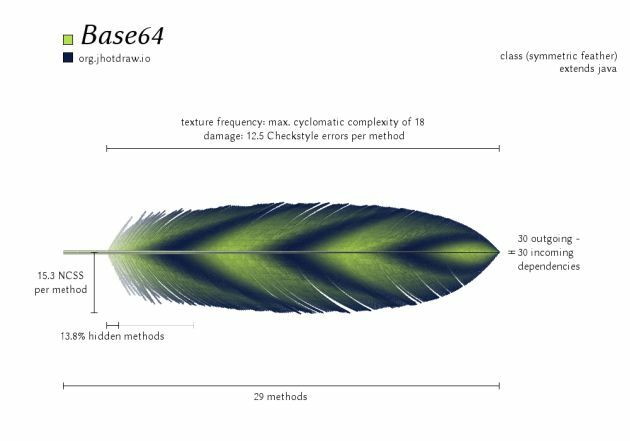 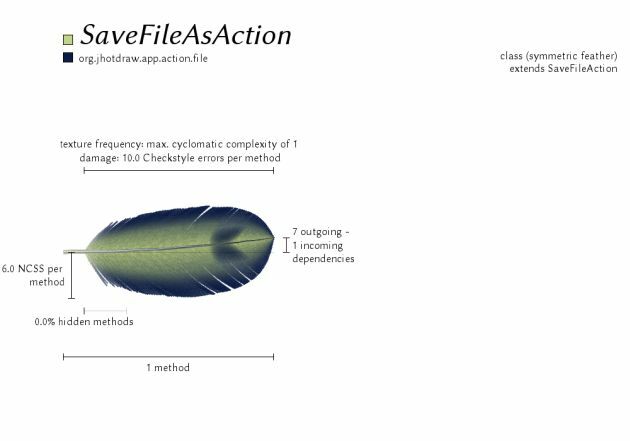 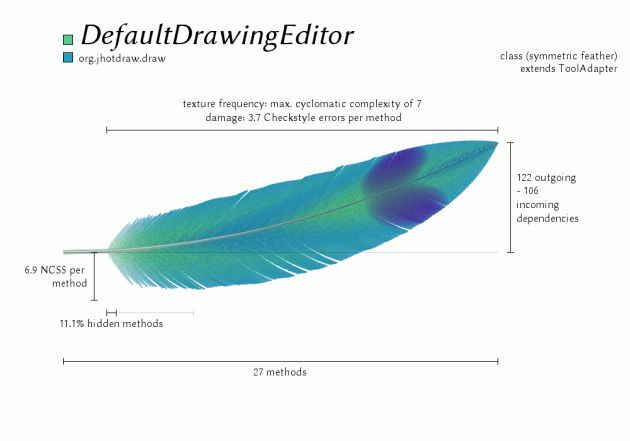 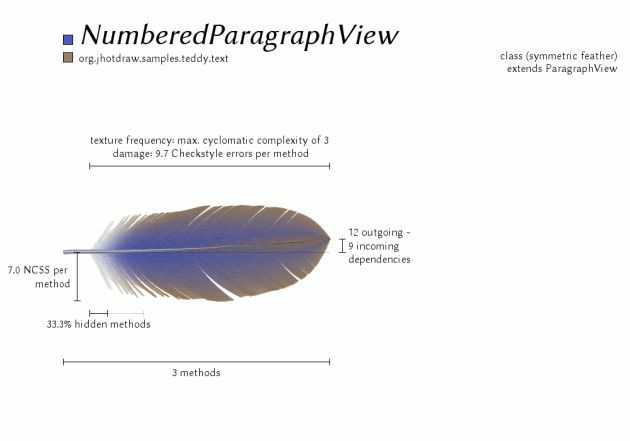 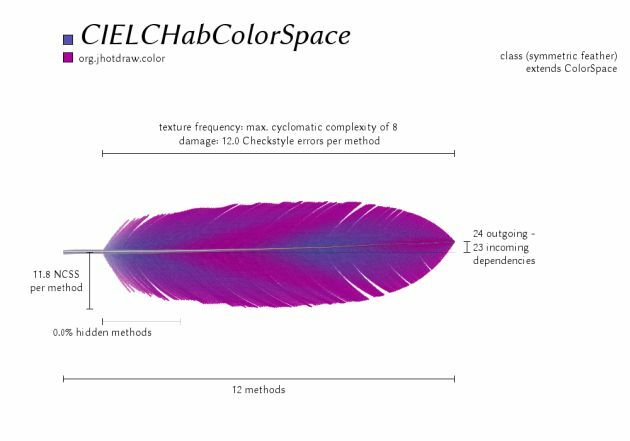 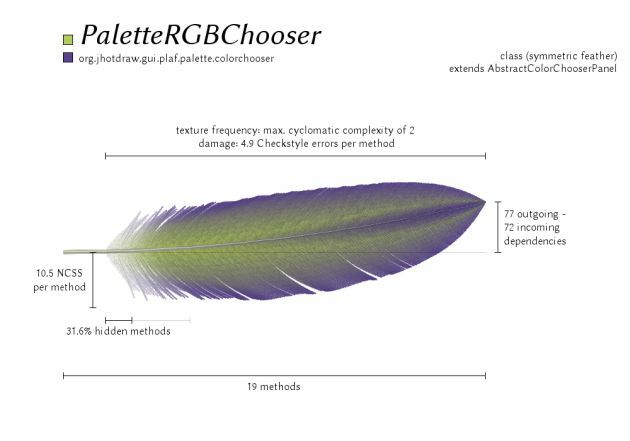 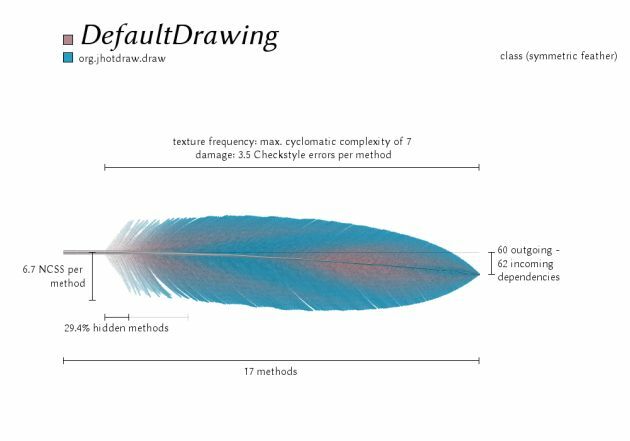 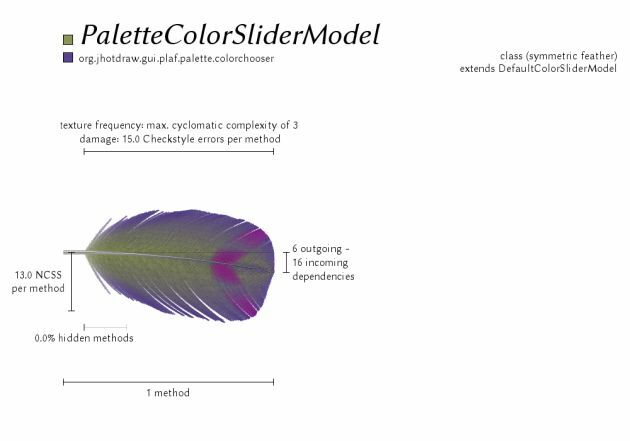 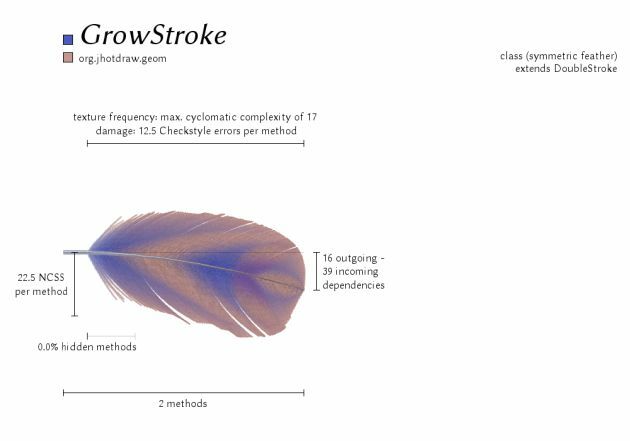 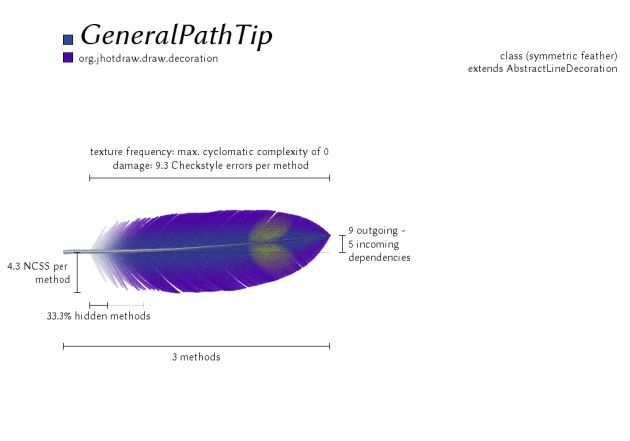 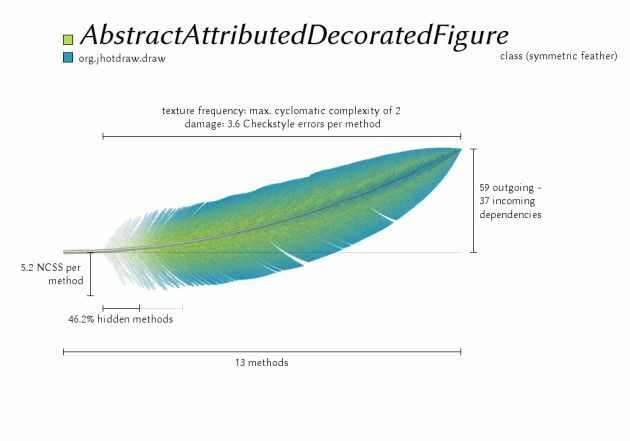 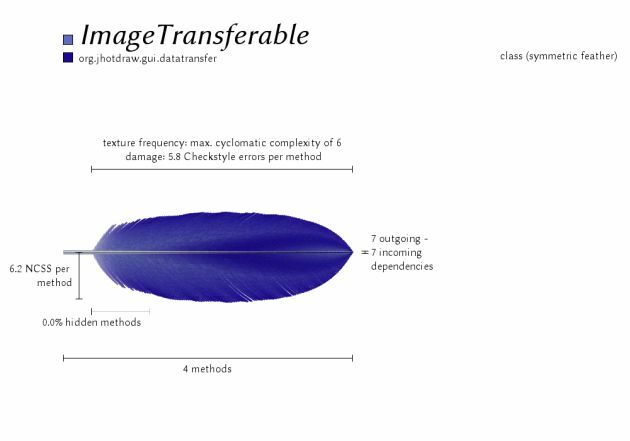 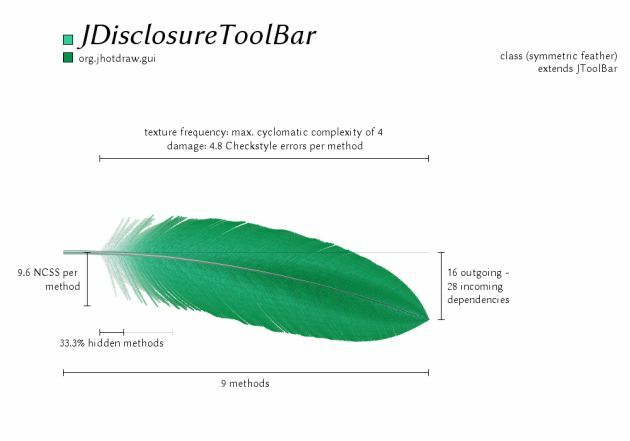 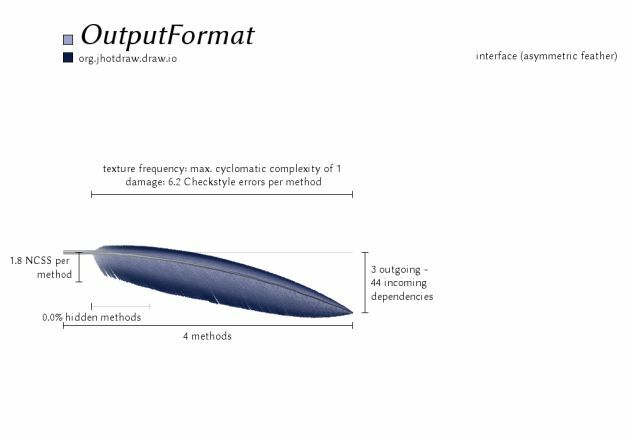 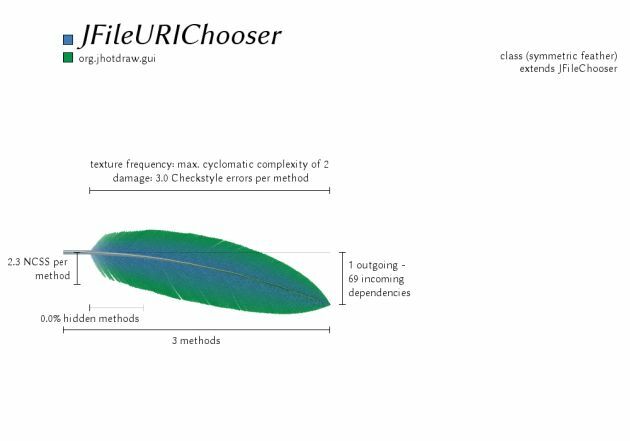 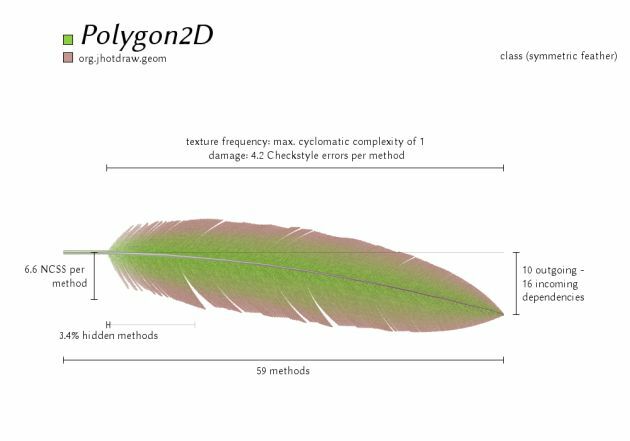 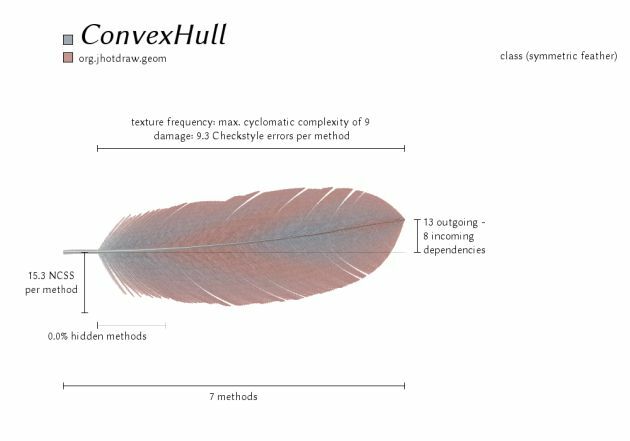 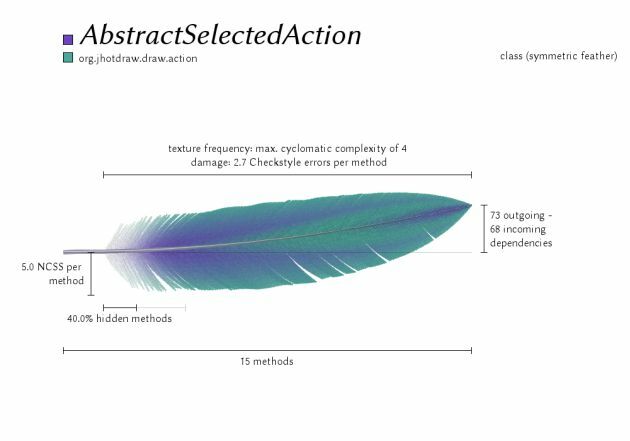 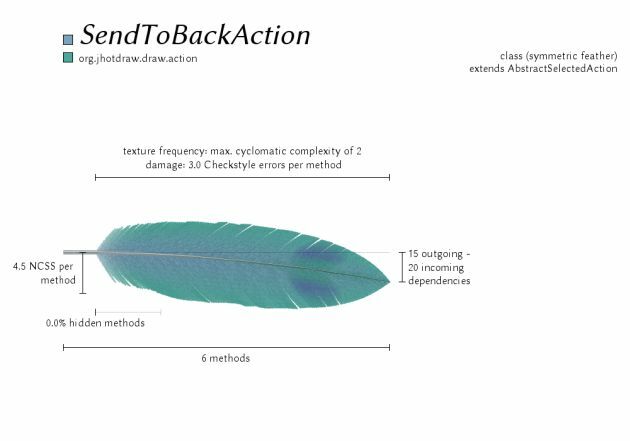 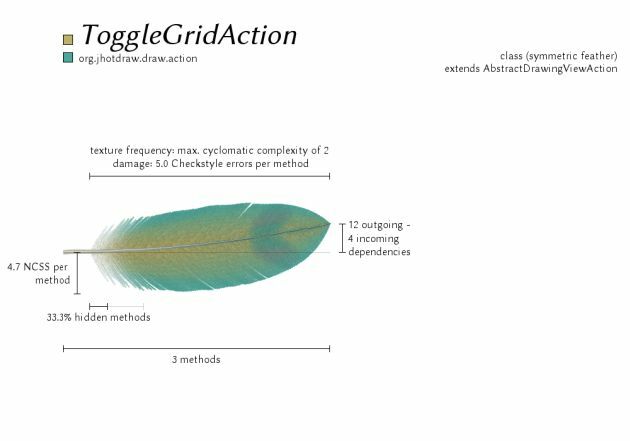 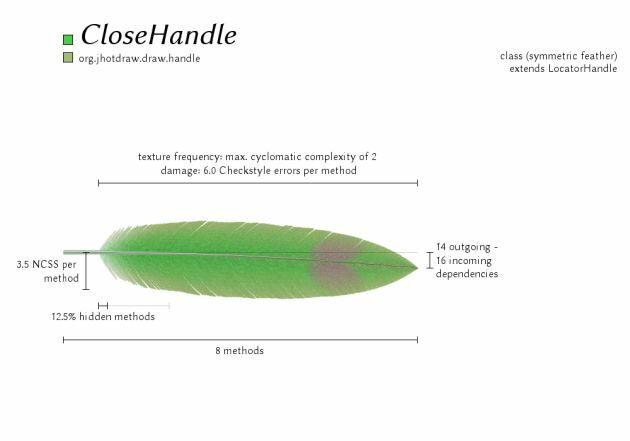 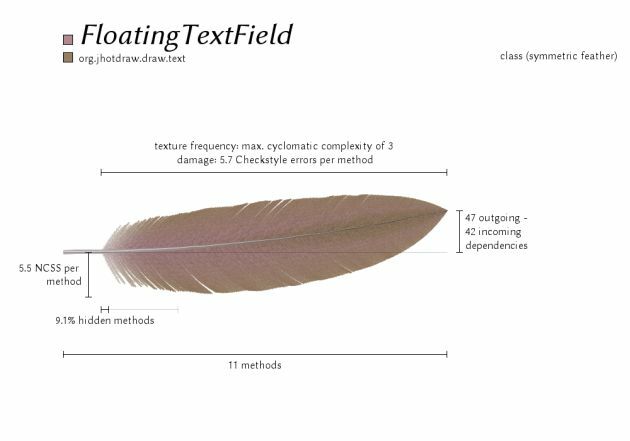 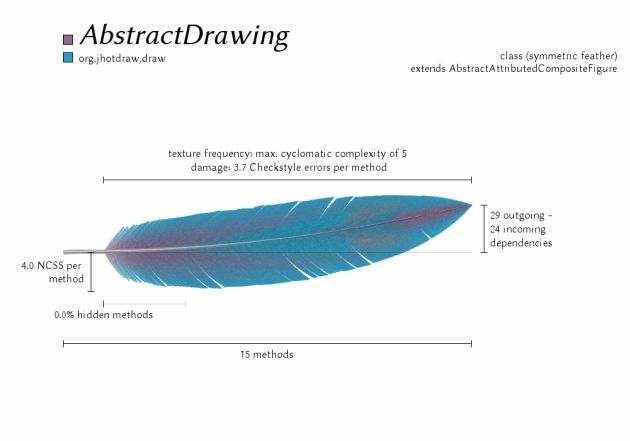 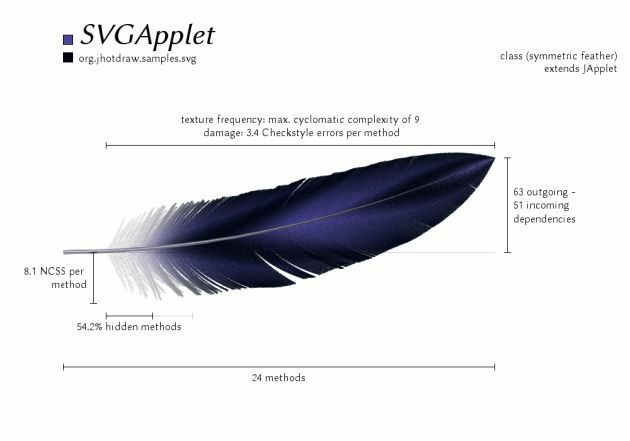 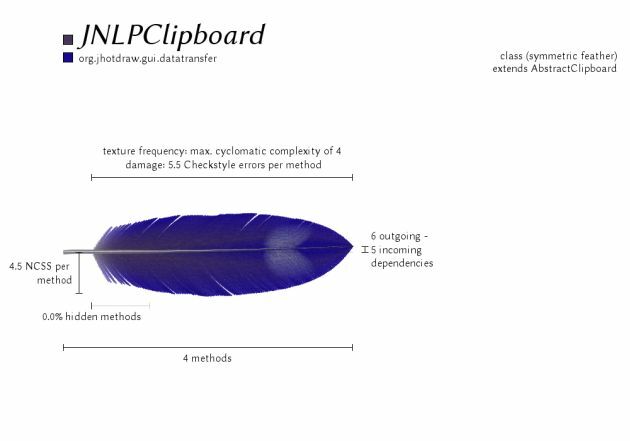 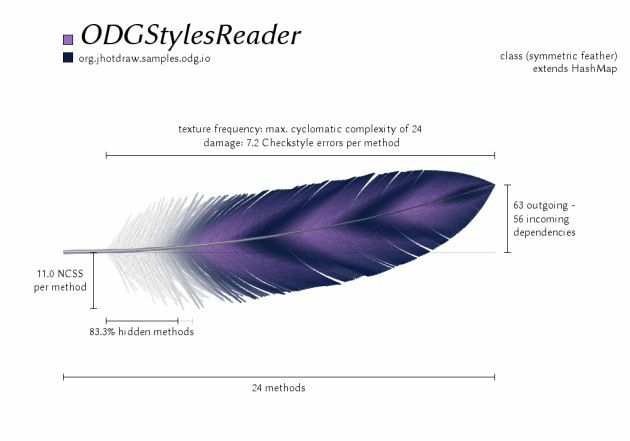 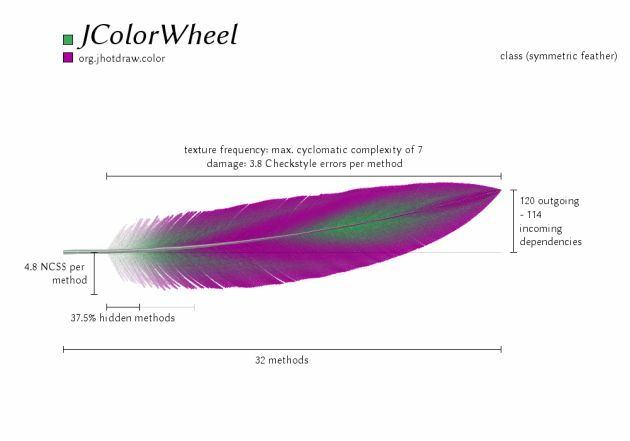 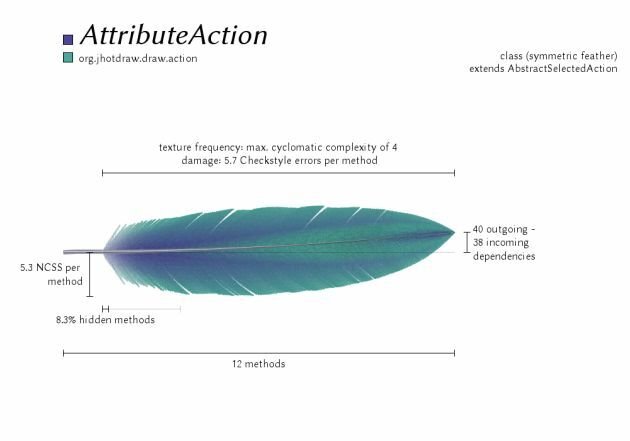 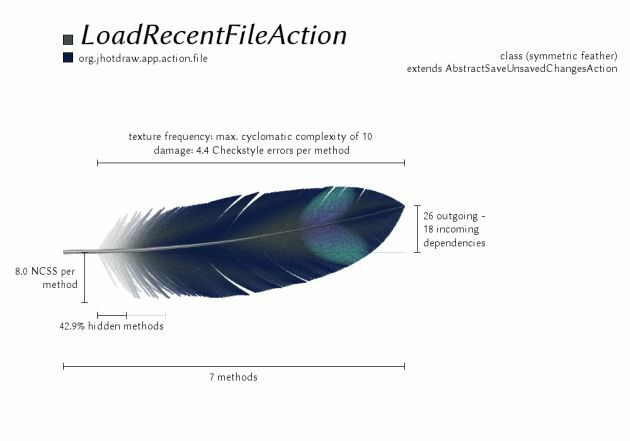 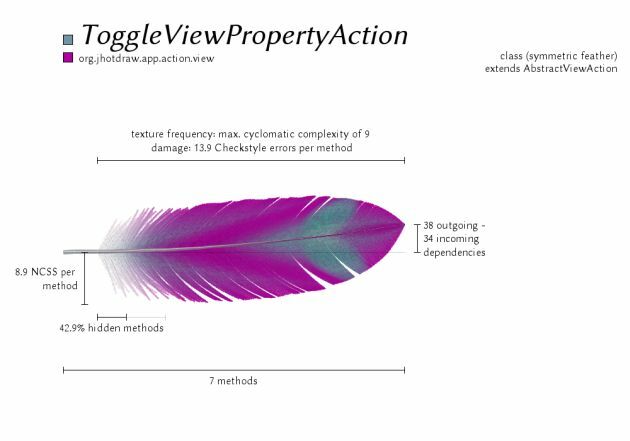 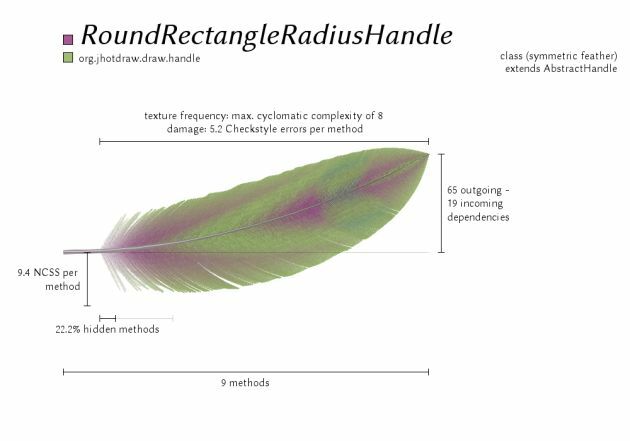 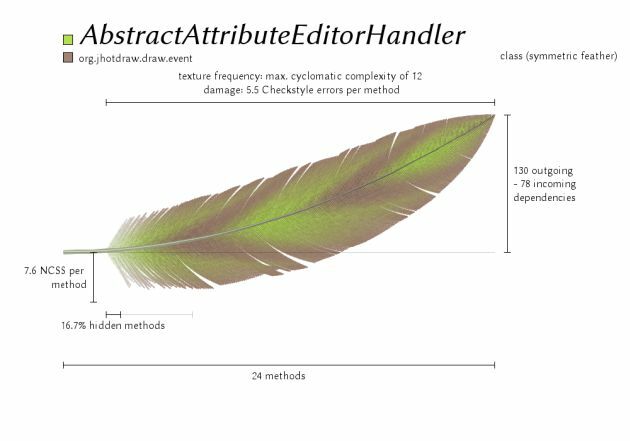 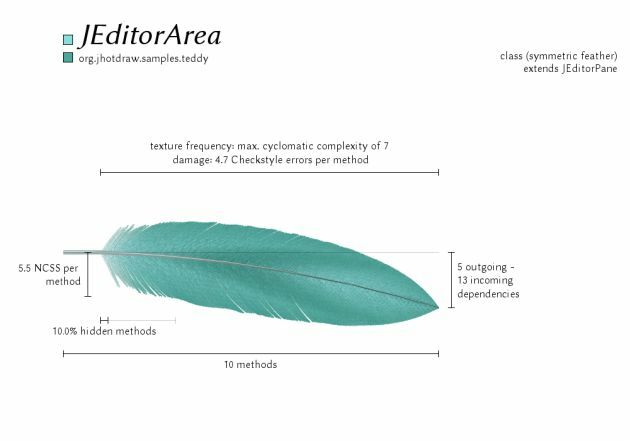 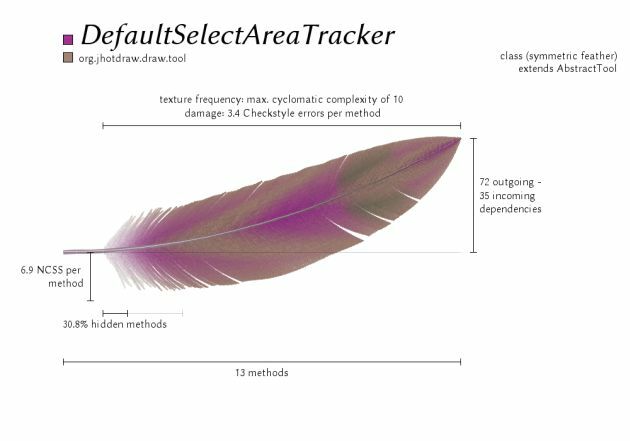 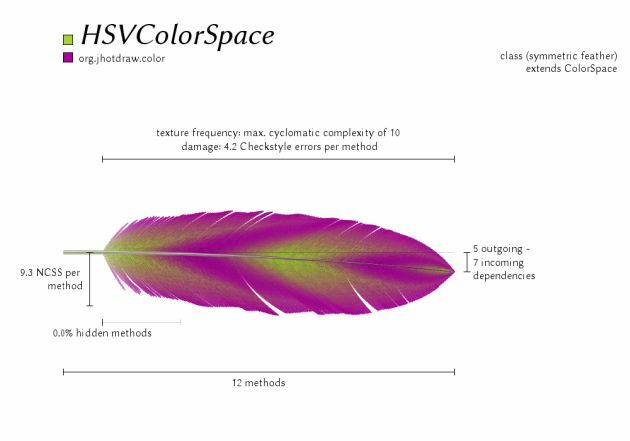 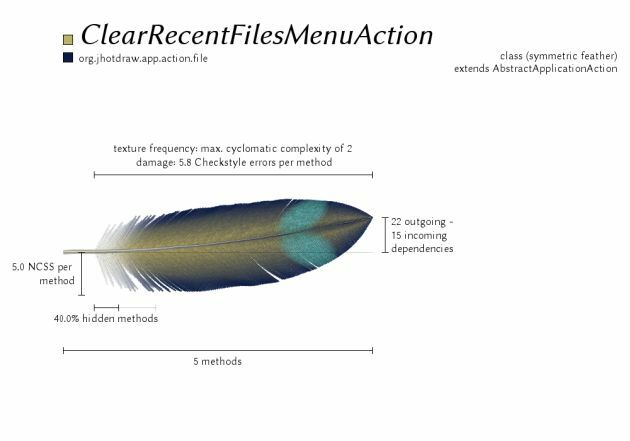 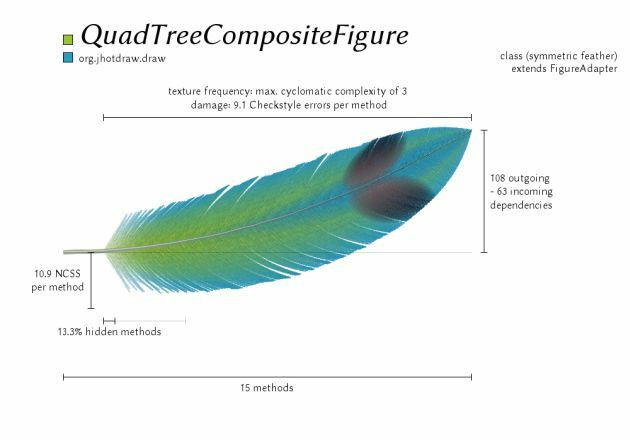 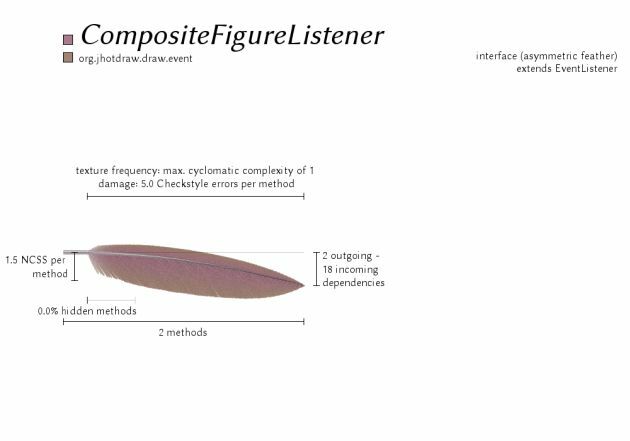 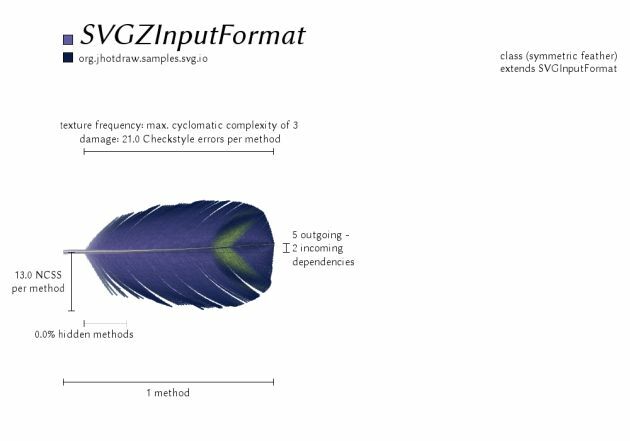 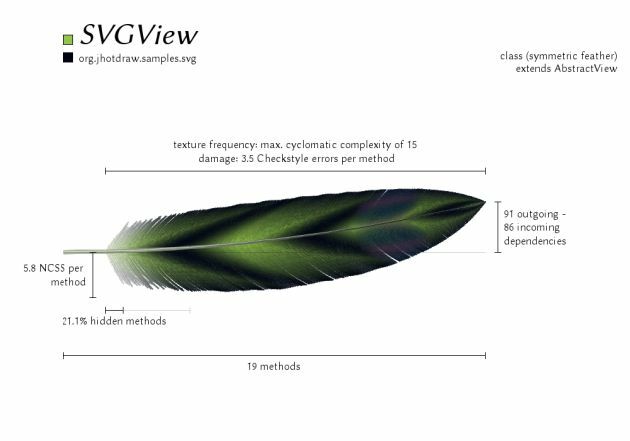 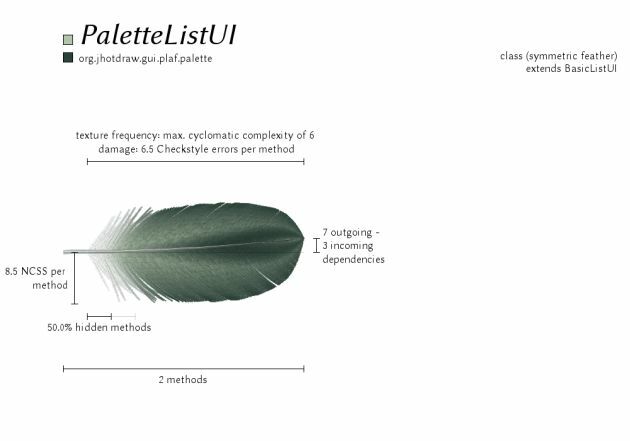 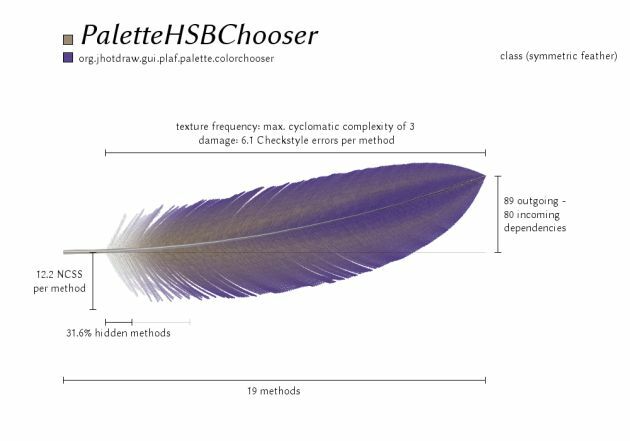 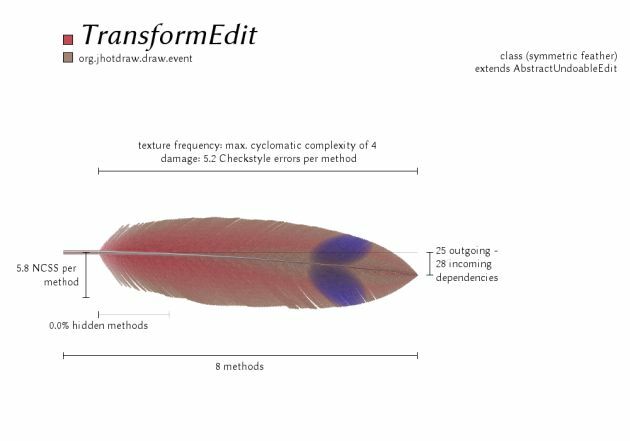 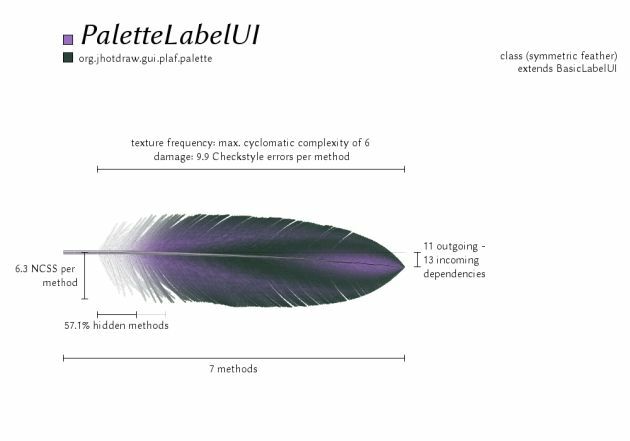 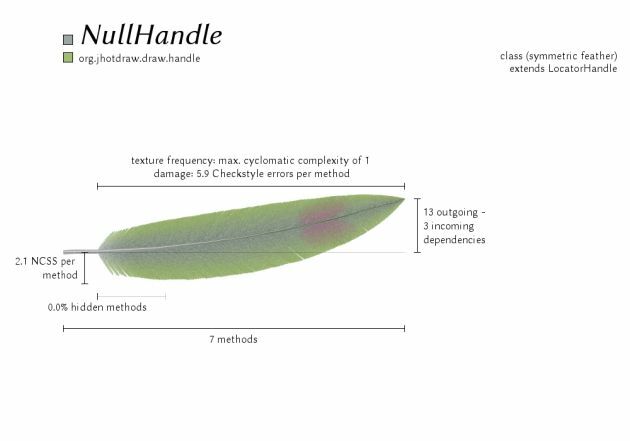 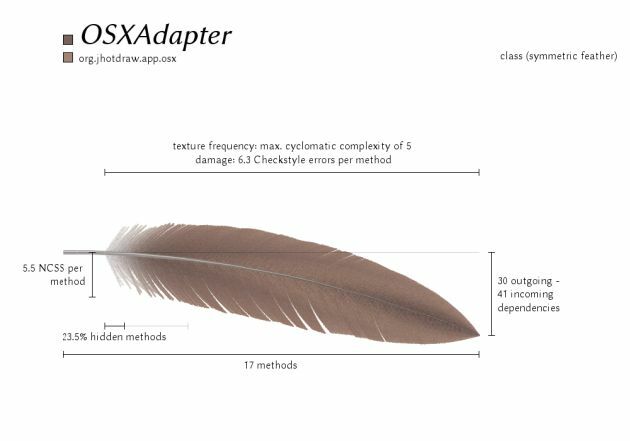 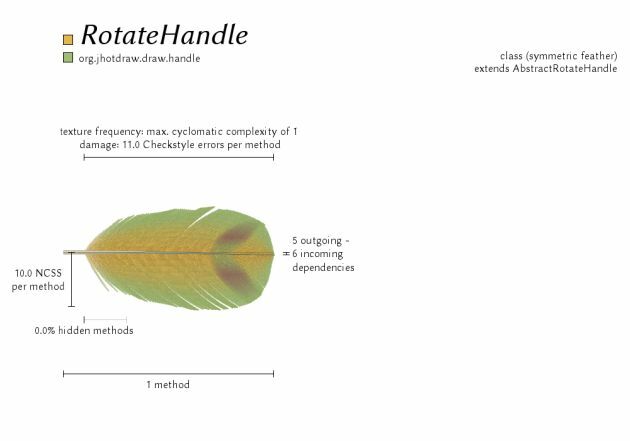 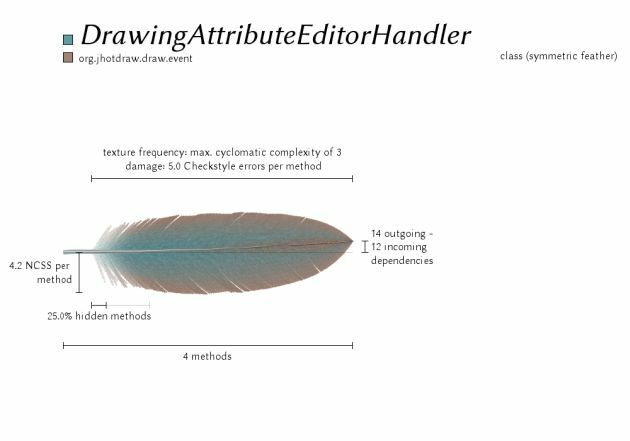 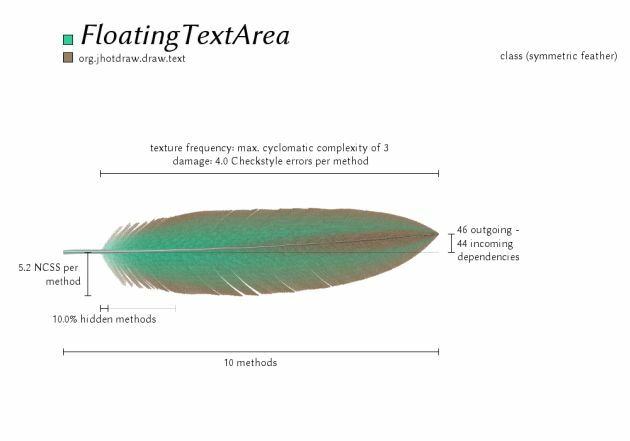 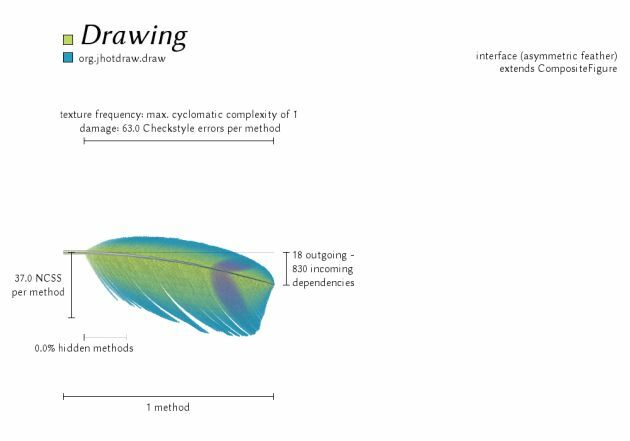 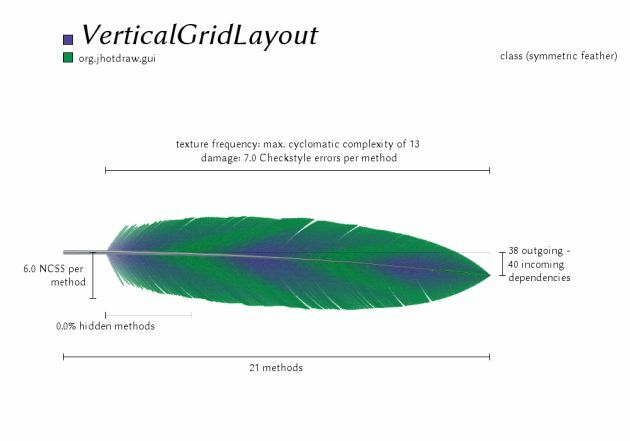 In order to give the code entities of a software system a discernible and recognizable face, this paper presents Software Feathers, an approach for mapping characteristics of object-oriented code entities to features of artificially generated feathers. 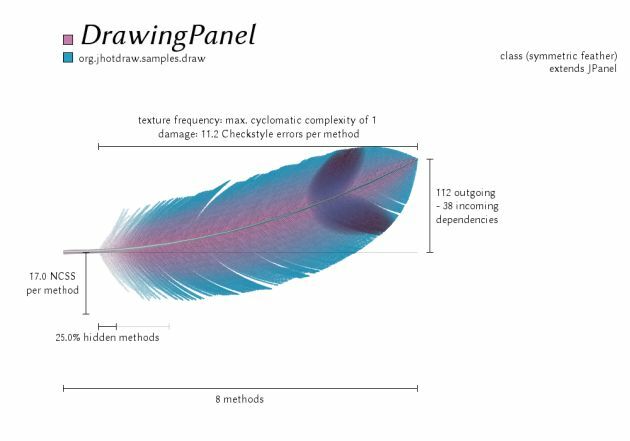 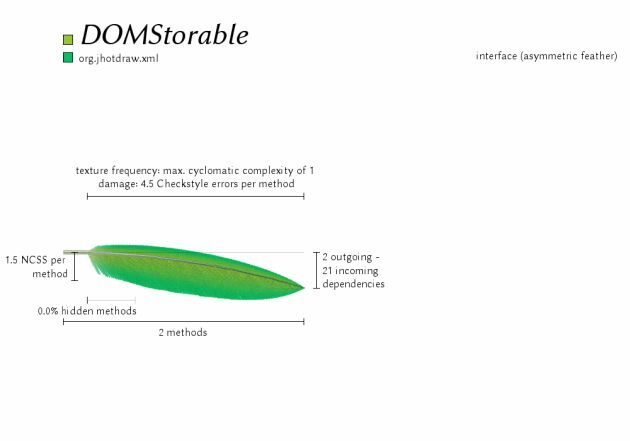 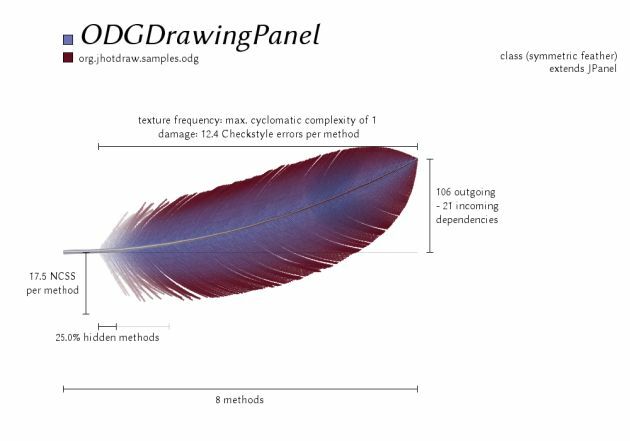 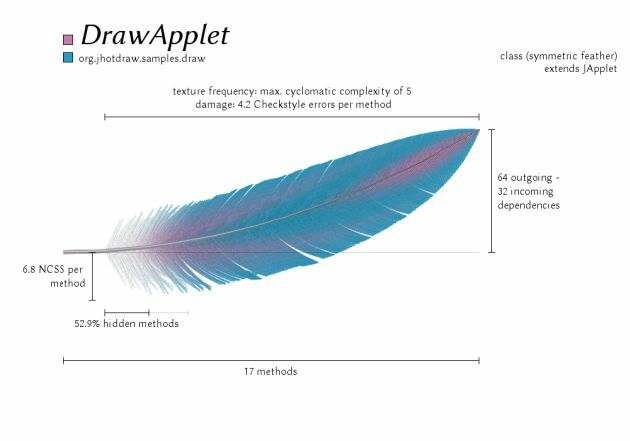 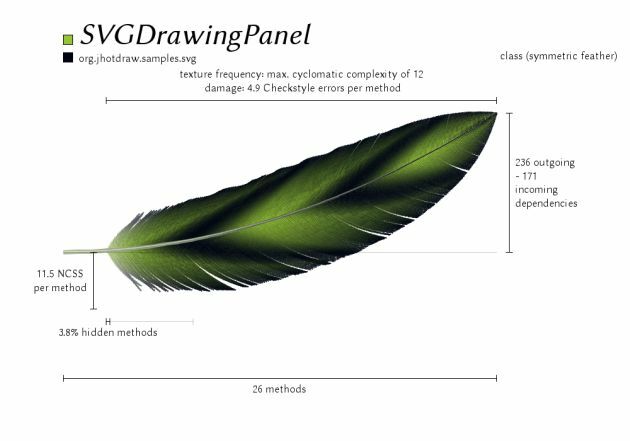 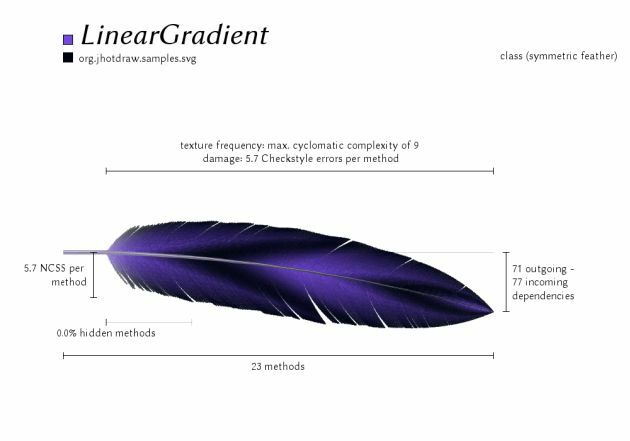 A parameterized drawing algorithm is described that generates pseudo-realistic feathers as 2D graphics. 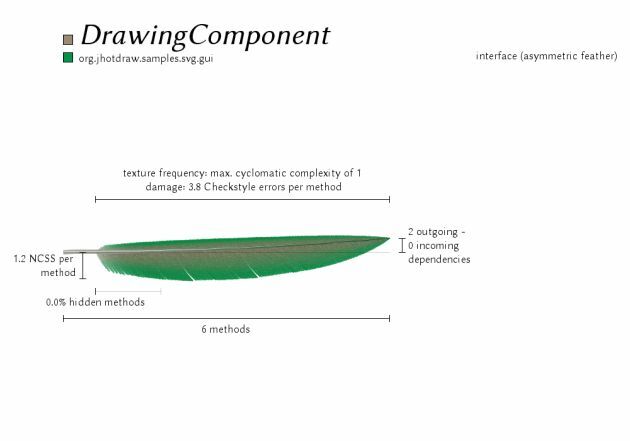 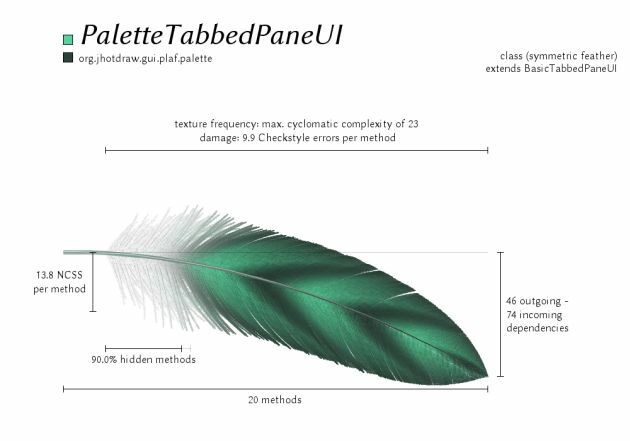 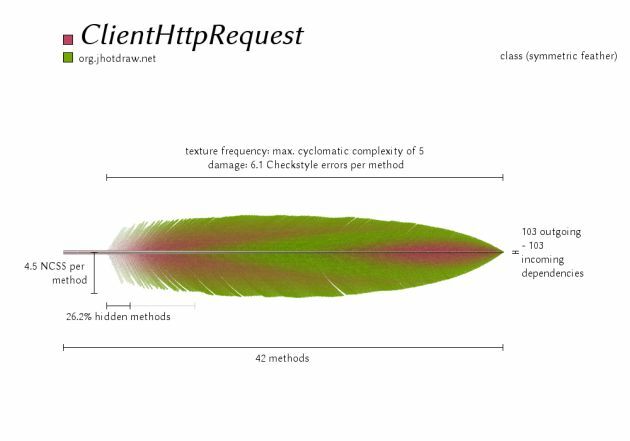 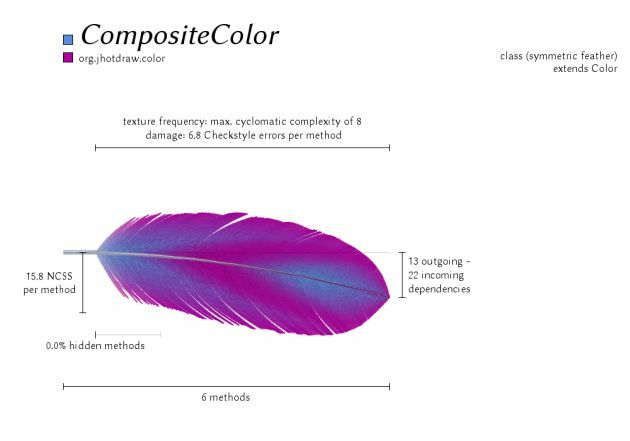 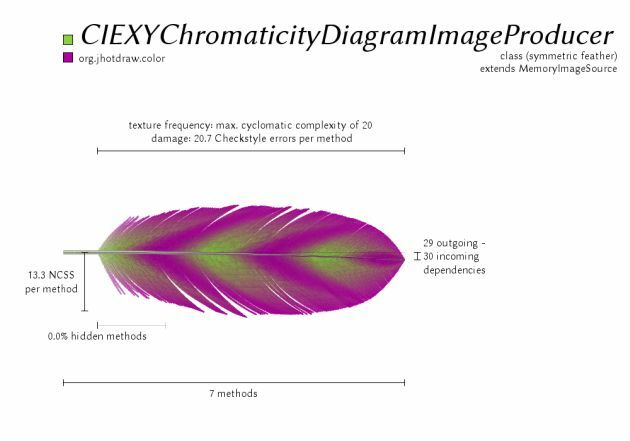 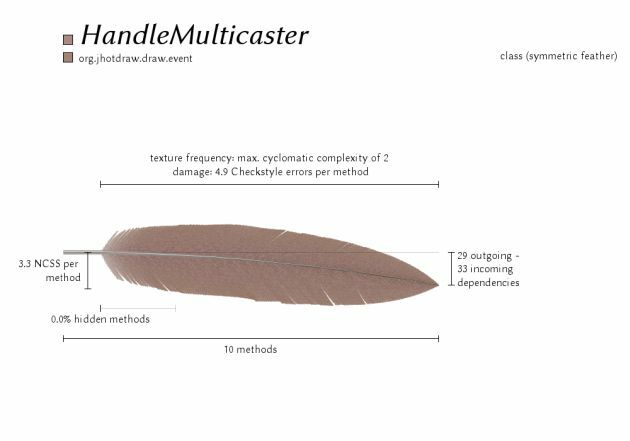 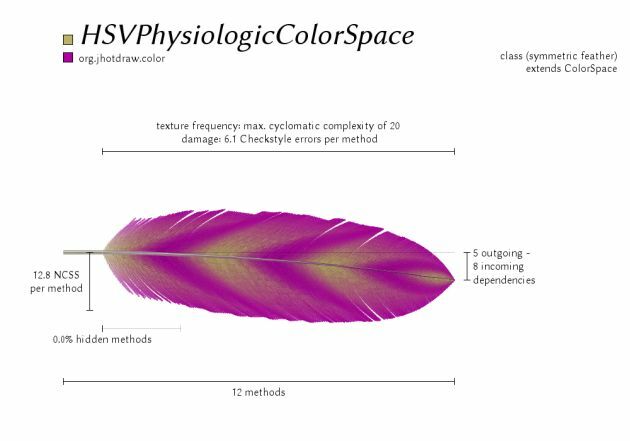 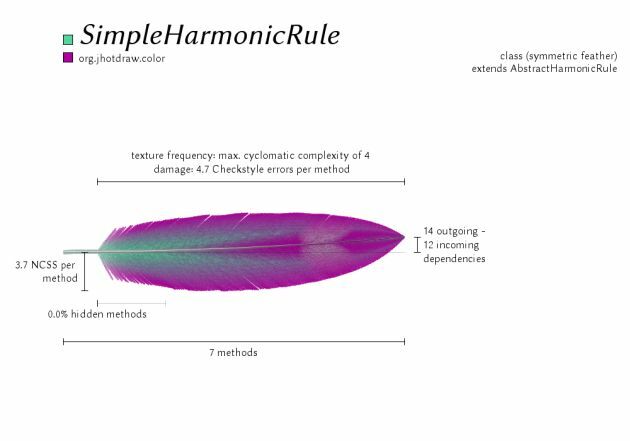 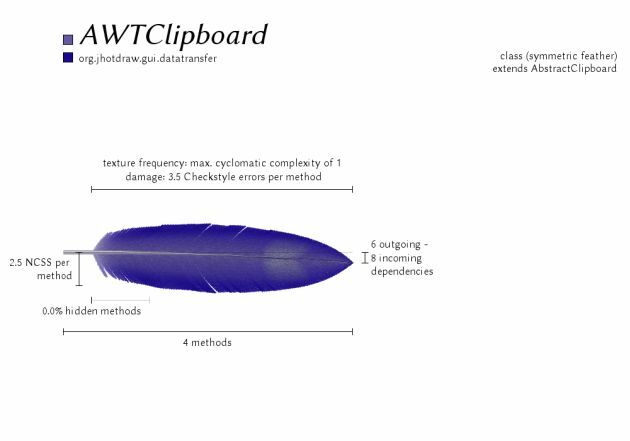 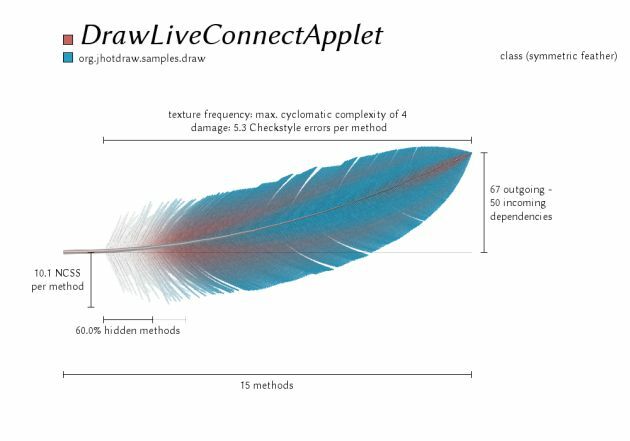 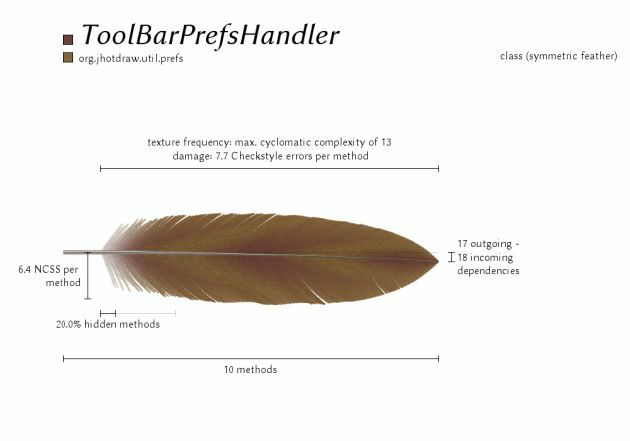 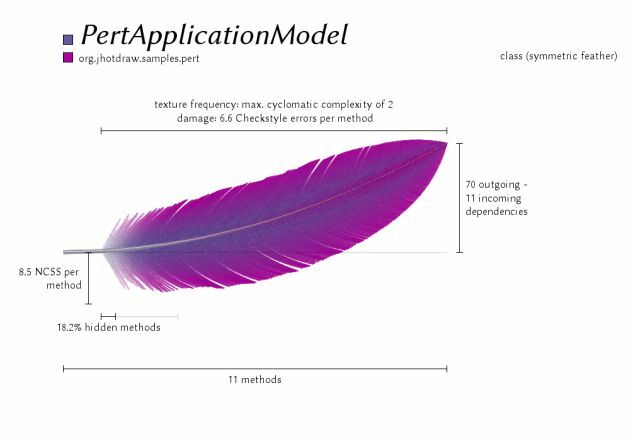 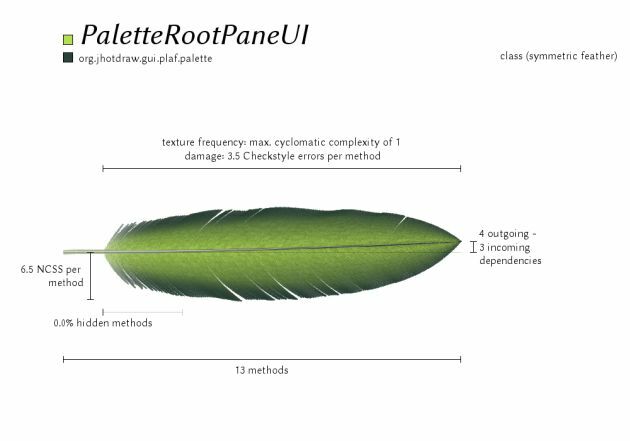 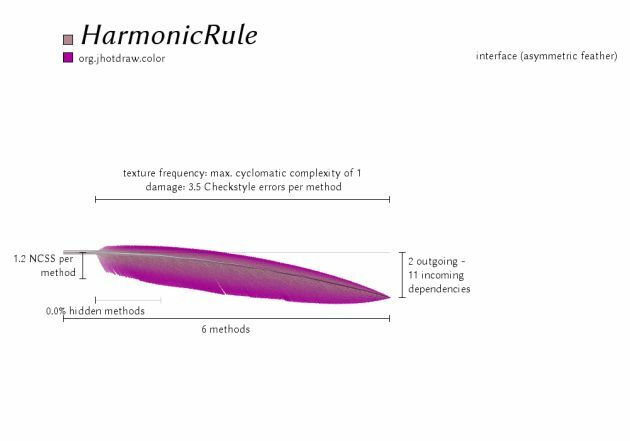 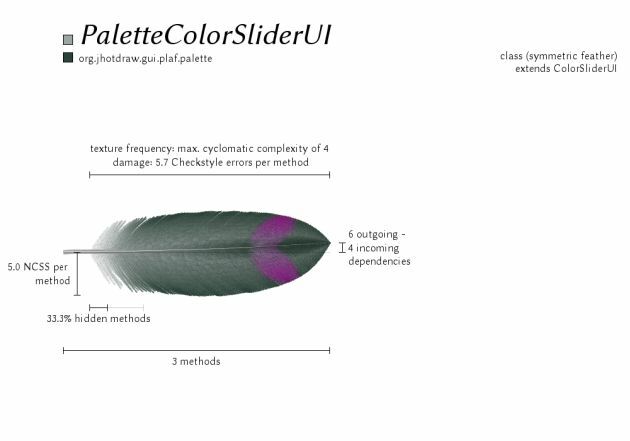 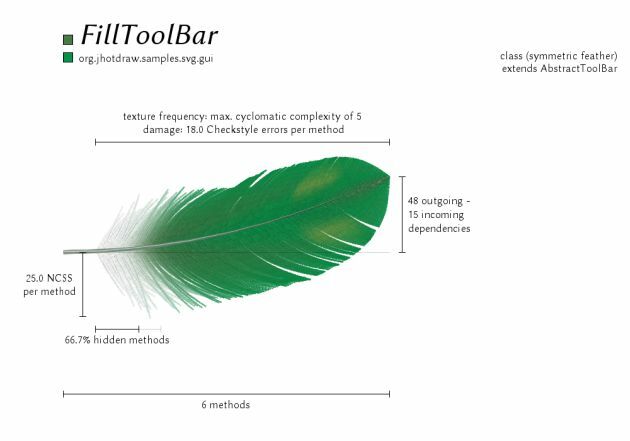 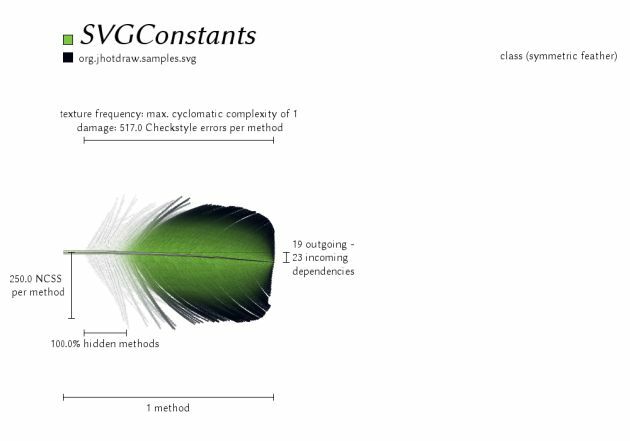 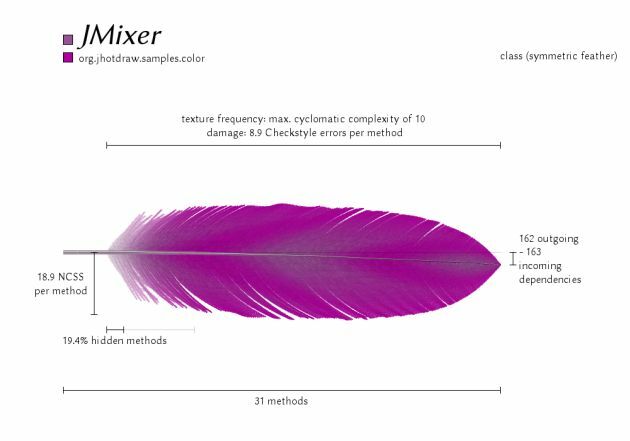 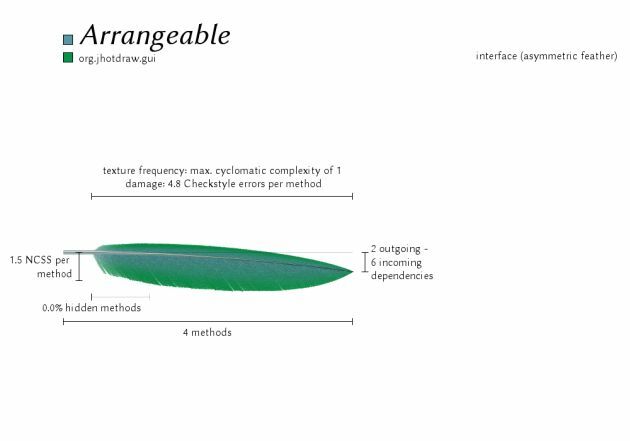 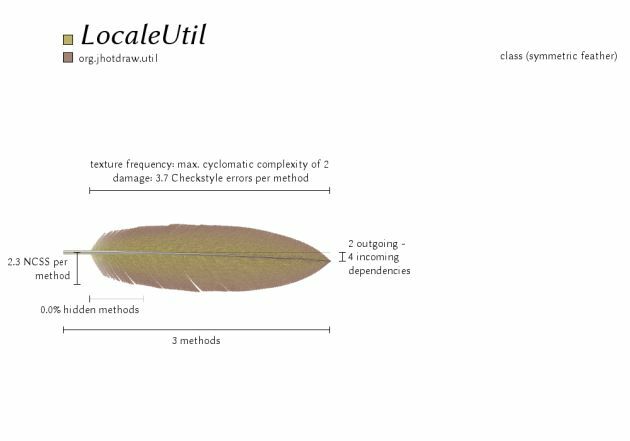 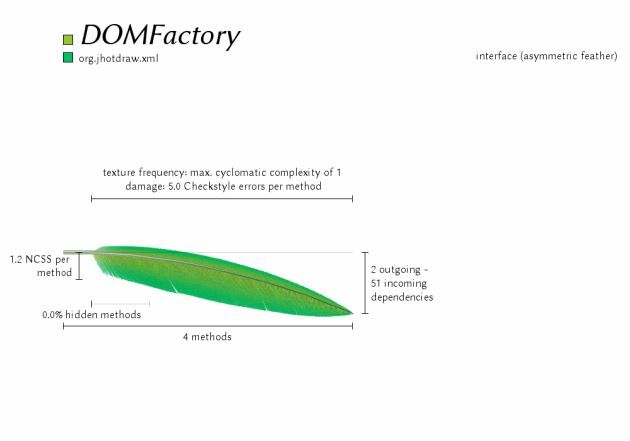 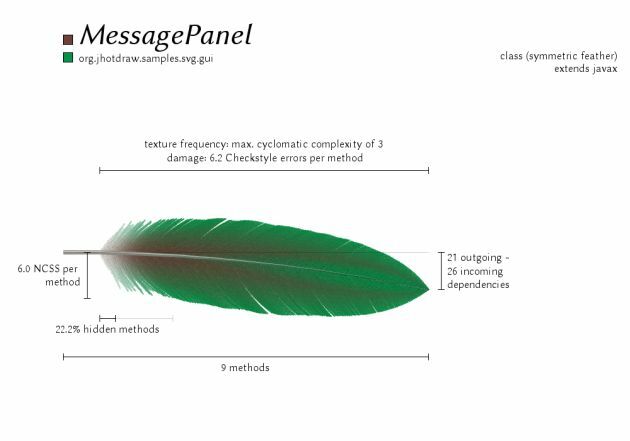 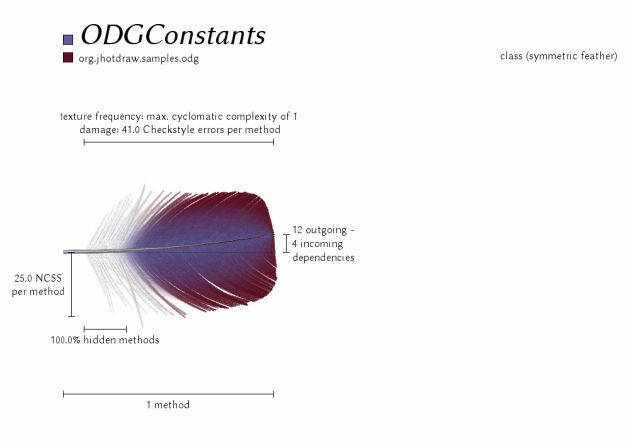 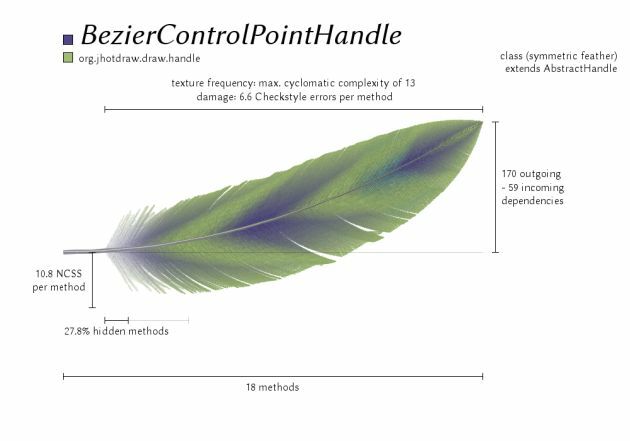 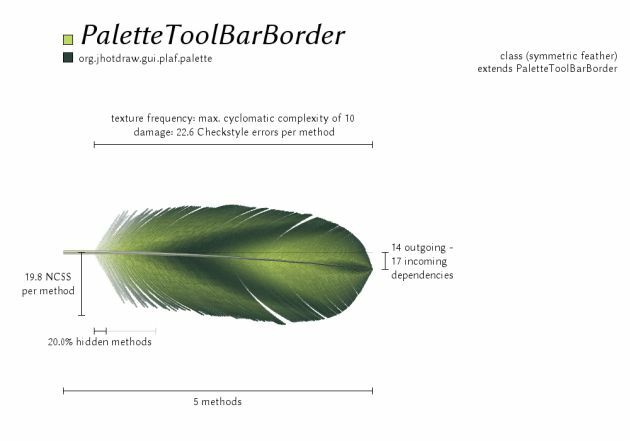 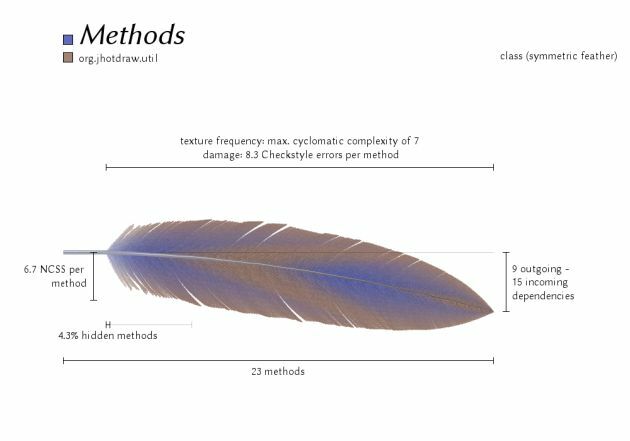 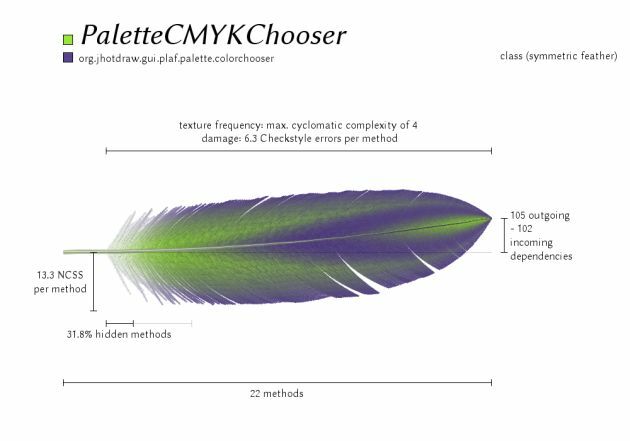 The parameters of the feathers are connected to characteristic software metrics measuring, among others, the size, complexity, and quality of interfaces and classes. 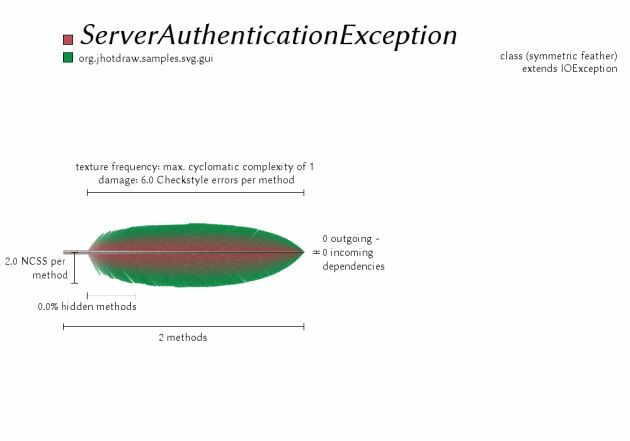 Applying the approach demonstrates that categories of code entities can be discerned, problems in the code can be detected, and the evolution of code can be studied. 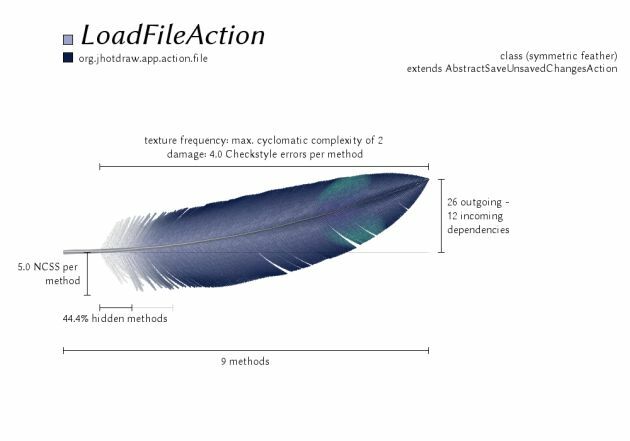 A promising application is embedding the feathers into documentation and IDEs for improving navigation and unobtrusively educating software developers in software metrics. 578 classes and interfaces of JHotDraw 7.6 visualized as Software Feathers.